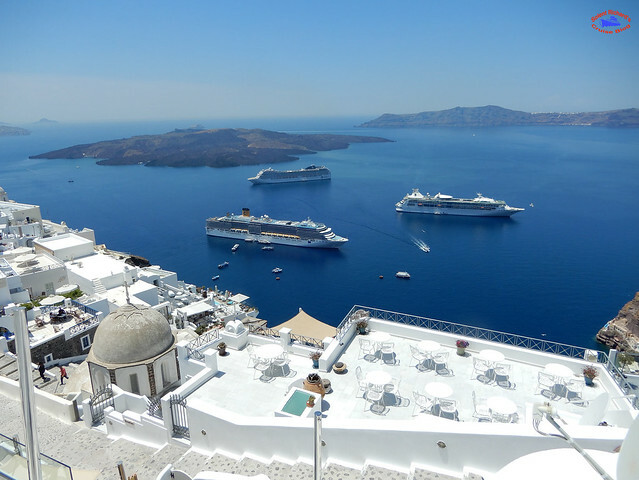 Santorini is probably the most archetypal of Greek islands on the Mediterranean cruise ship circuit, and on most days of the season can accommodate upwards of six ships. 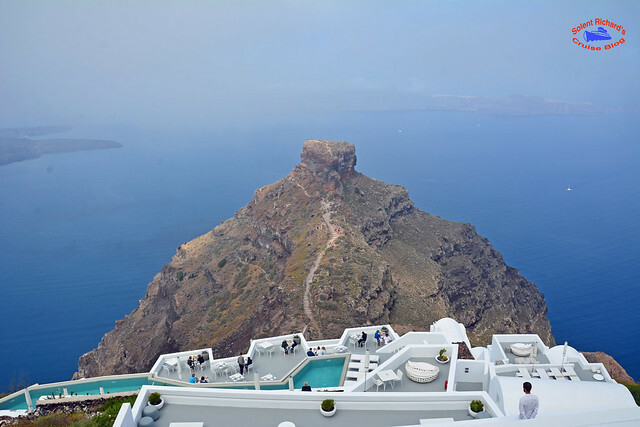 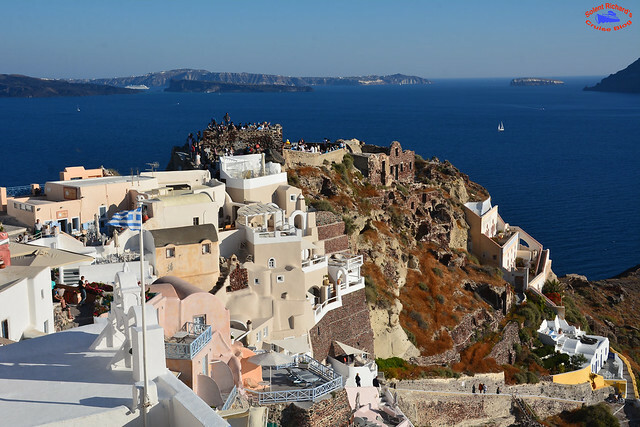 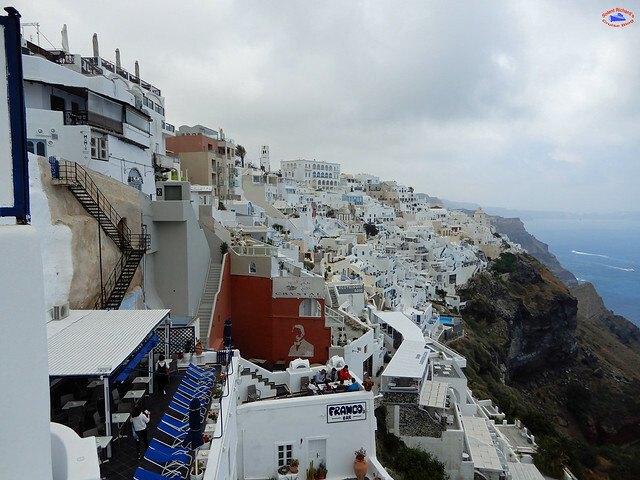 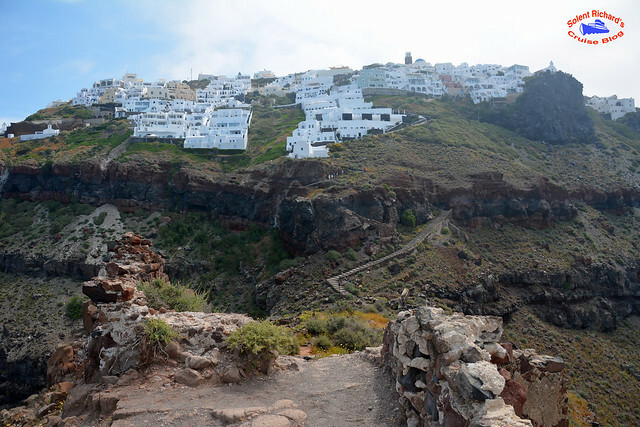 The whitewashed, cubiform houses of its 2 principal towns, Fira and Oia, cling to cliffs above an underwater caldera (crater). 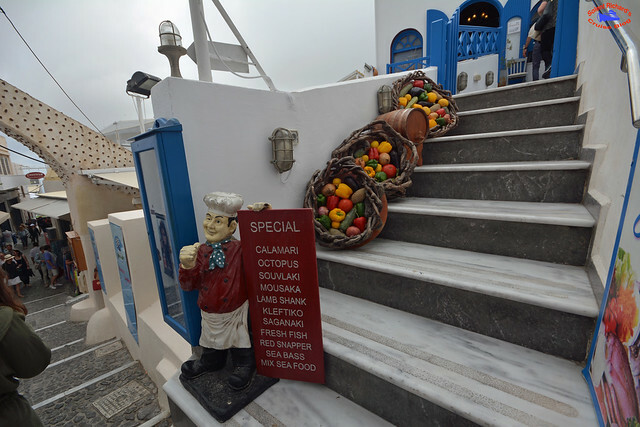 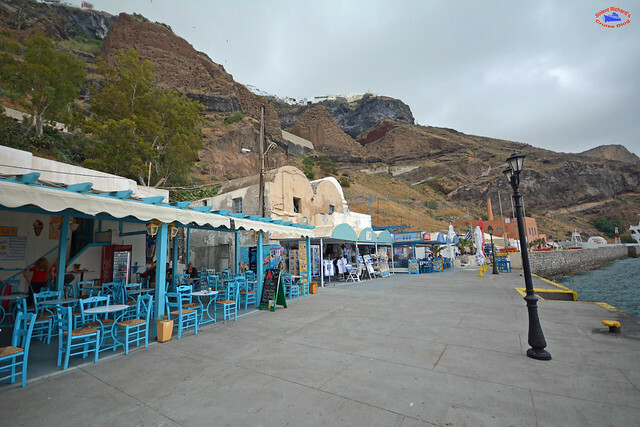 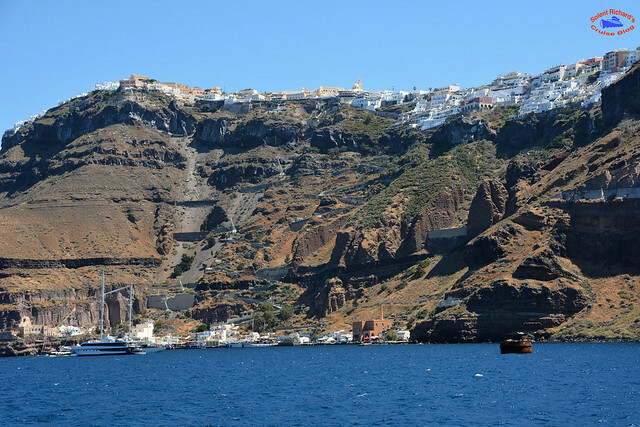 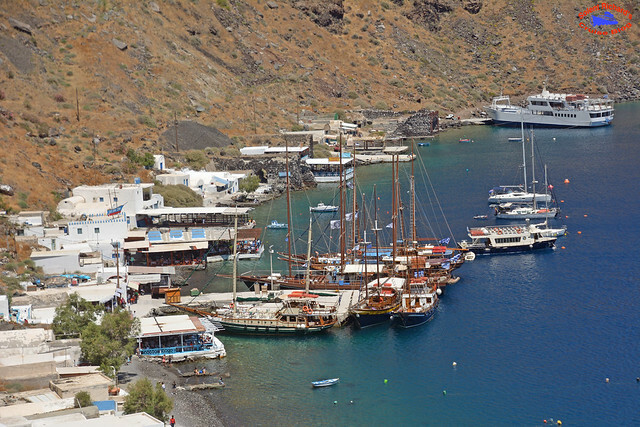 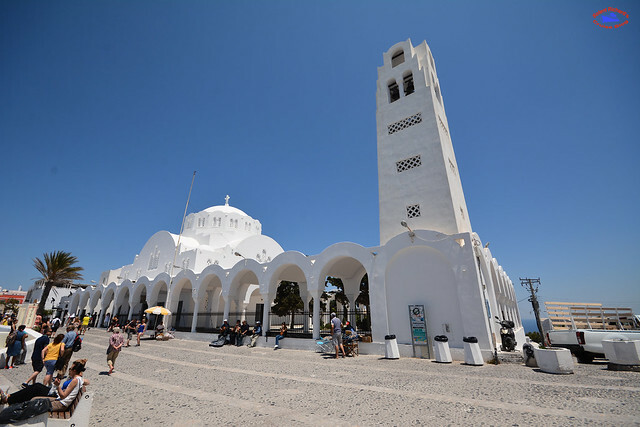 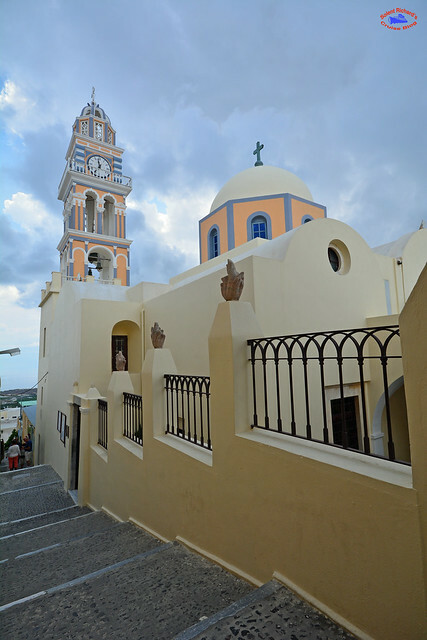 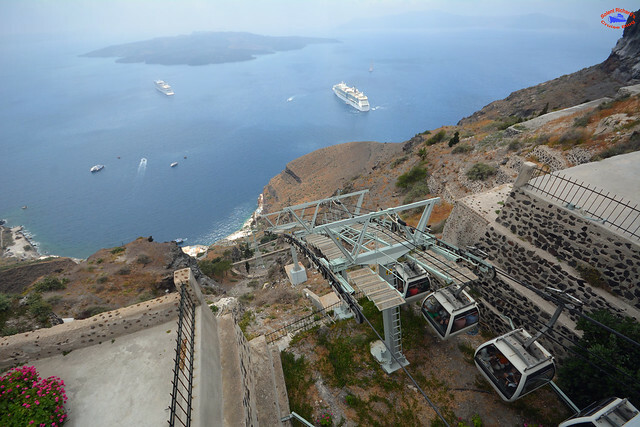 The next part of this review describes what cruise ship passengers can expect as they step ashore below the main town on the island, Fira. 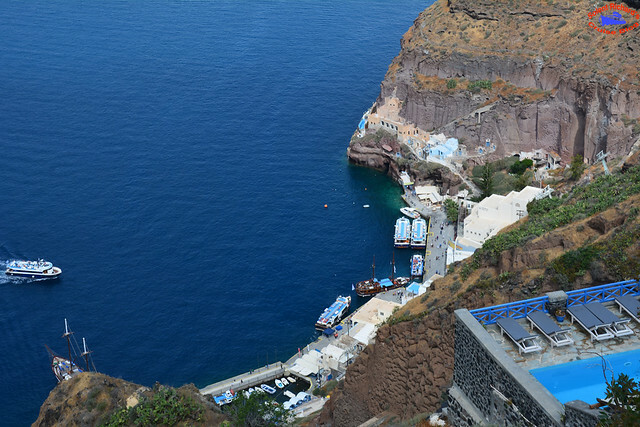 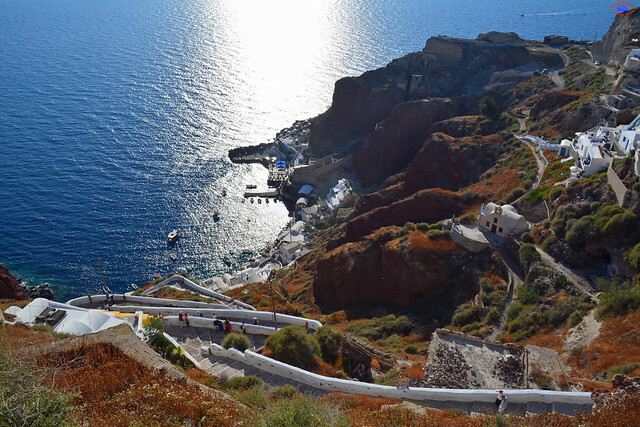 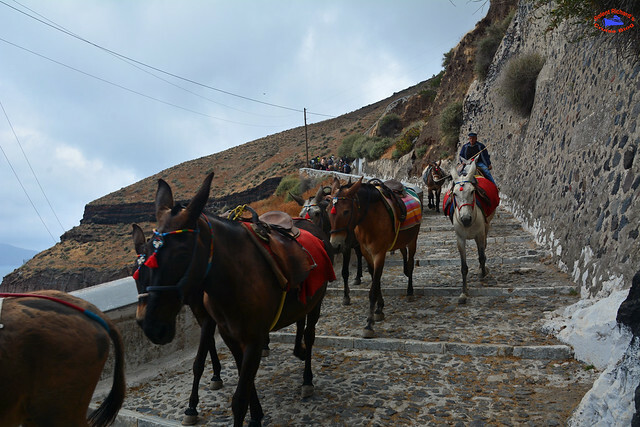 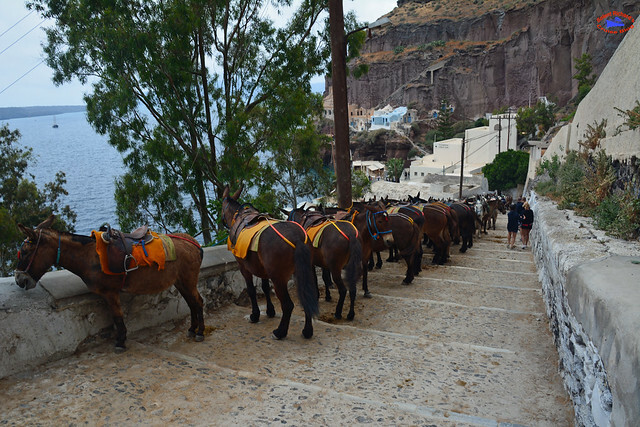 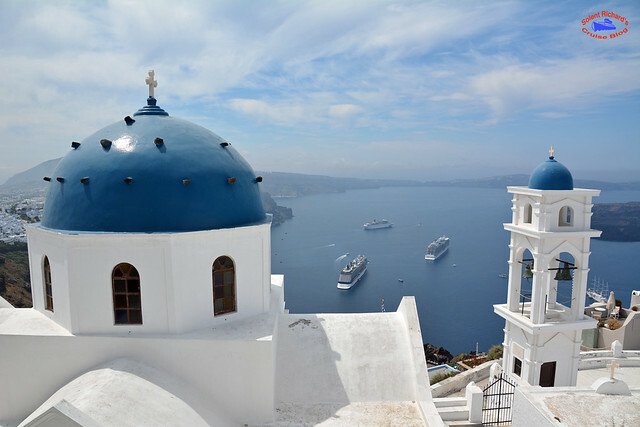 Fira will then be covered in detail before other options, on how to spend one’s day on Santorini, are explored. 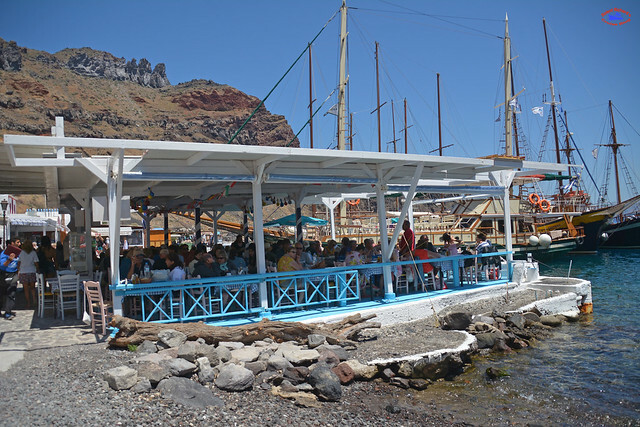 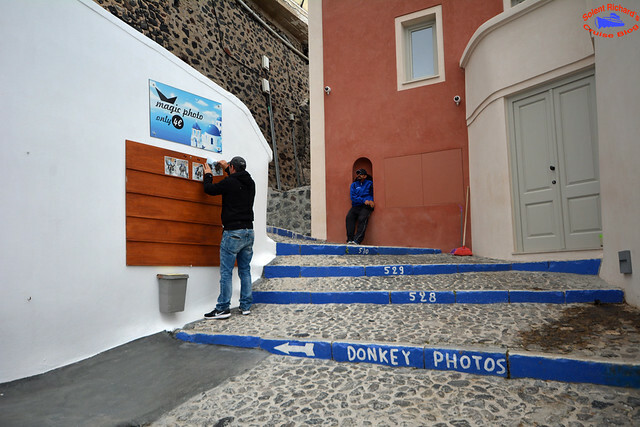 Hopefully this review will be of benefit to new visitors to Santorini as well as those who are returning. 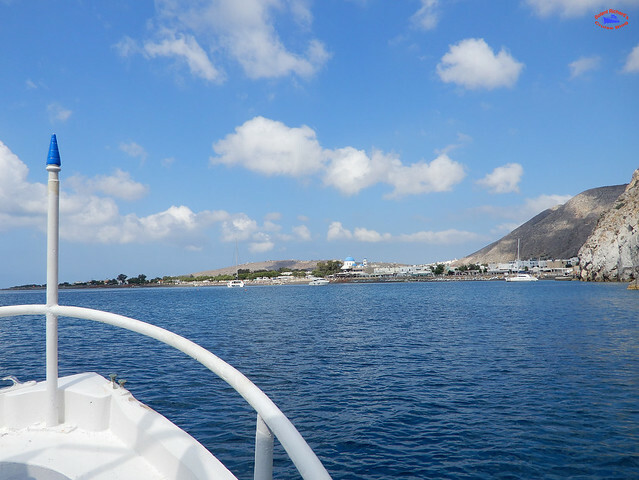 Other options are to take a boat from the tender port which will be described later in this review. 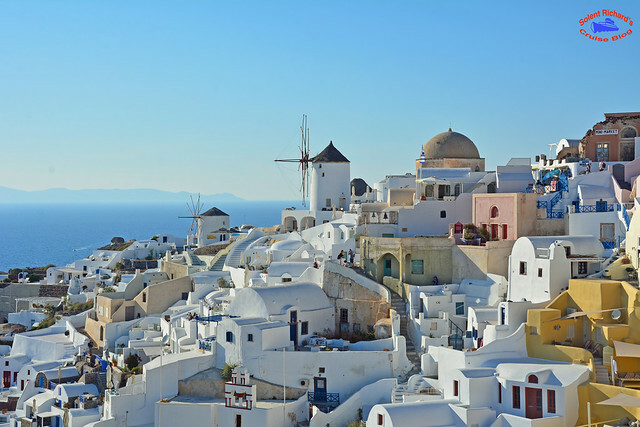 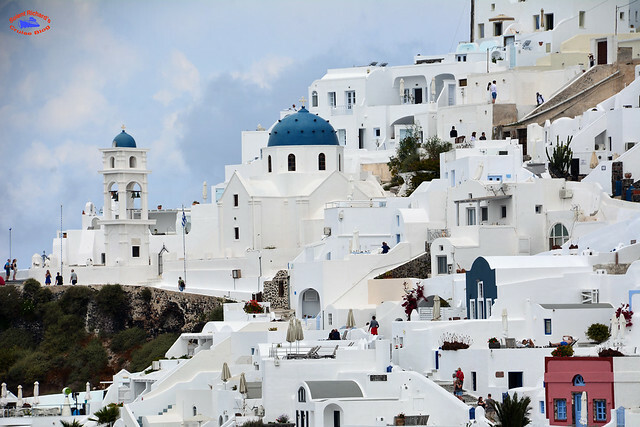 Fira is the capital of Santorini and its white-washed houses, built on the edge of the 400 metres high ‘caldera’, are the iconic face of both cruise ship and shoreside holiday brochures. 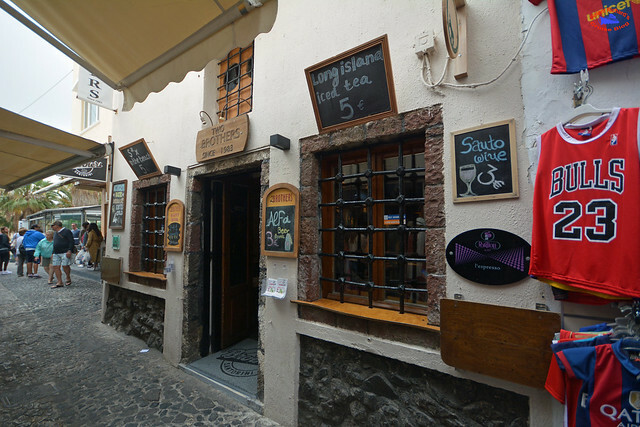 The town itself consists of mainly a labyrinth of narrow traffic-free streets filled with cafes, bars, restaurants, hotels and shops. 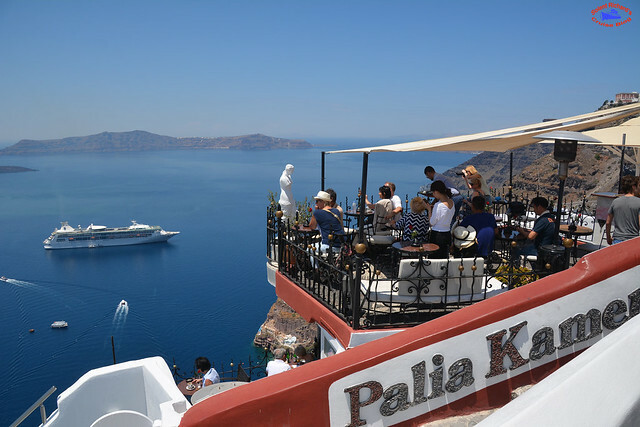 The majority of the cafes and restaurants offer panoramic views over the ‘caldera’ and some even boast several levels of terraced patios and balconies. 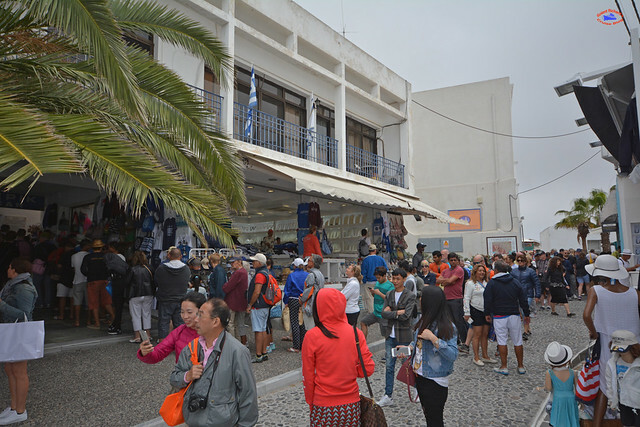 The town bustles once the tender boats arrive and the cafes fill up with ships’ passengers eager to make use of the usually complimentary wifi on offer. 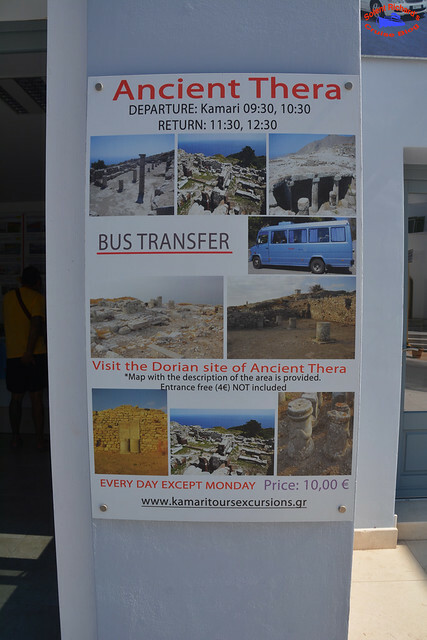 There is a pretty good local bus service. 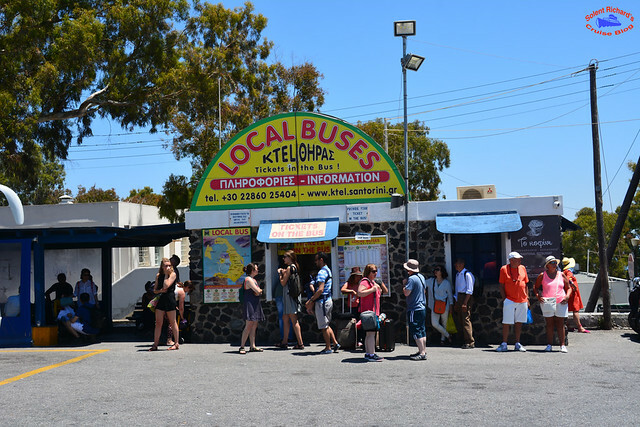 Buses leave around every 20 minutes to most of the island’s tourist spots. 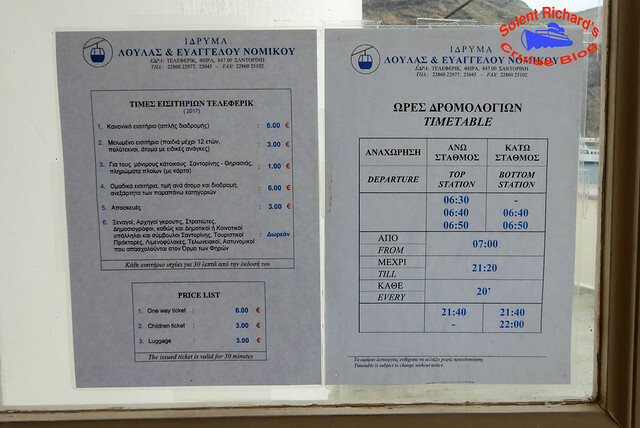 Fares are generally a fixed price of €1.80 no matter the length of the journey. 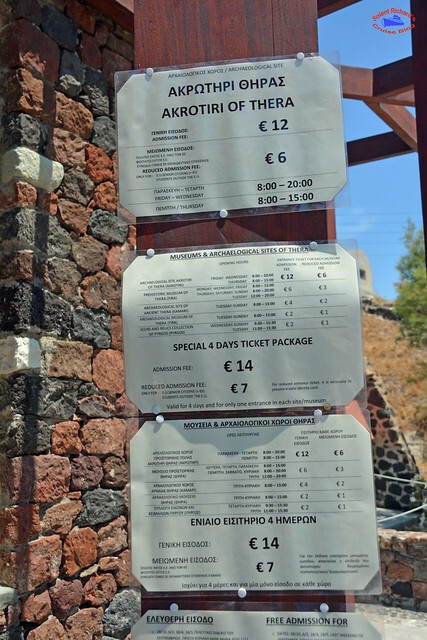 As the sign says at the terminus, tickets are bought on the bus. 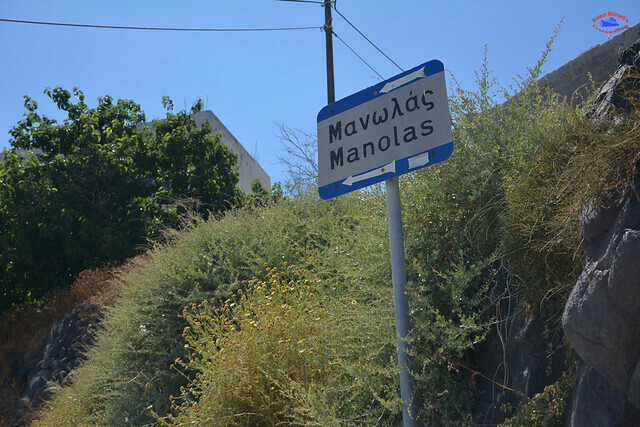 … where the break between the two enclaves is easily visible. 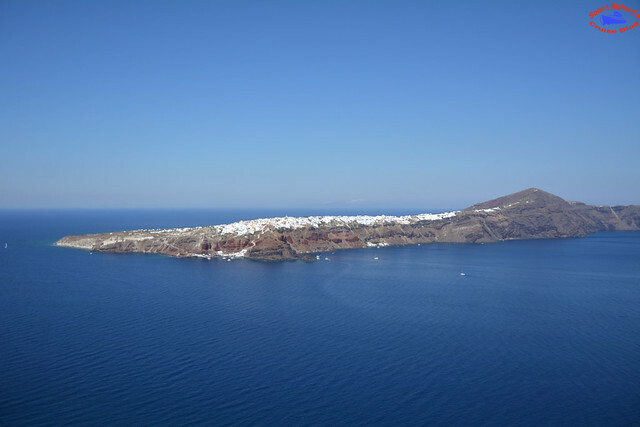 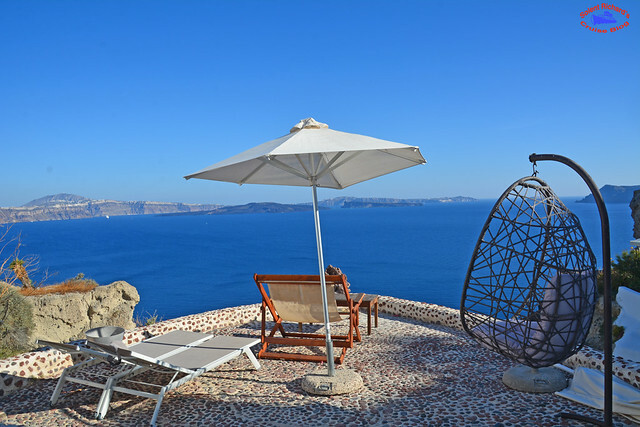 Located on the northern tip of the island, on a peninsula some 10 kilometres by road from Fira, Oia sits directly opposite the island of Thirasia which will be covered later. 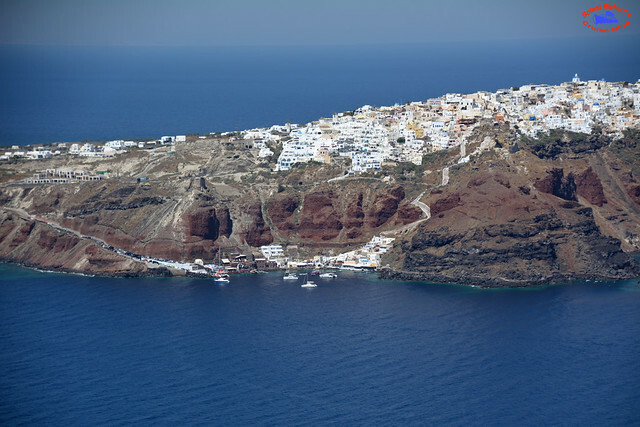 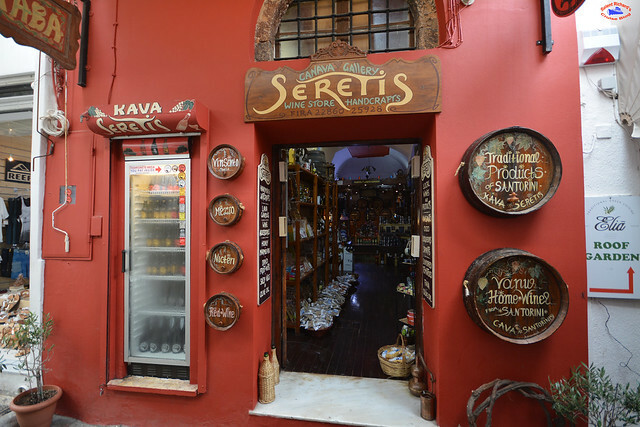 Visiting the three townships covered above are not the only options available when visiting Santorini. 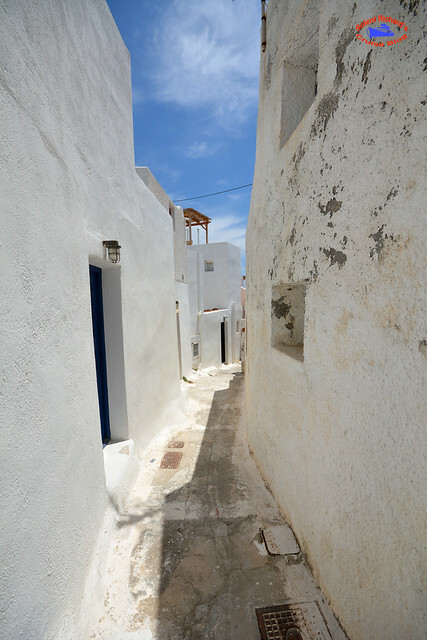 The main island, a horse-shoe shaped area of some 70 sq. 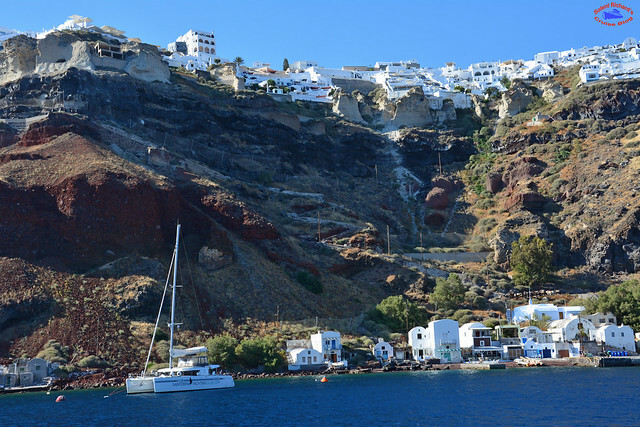 kilometres, offers a number of the best archeological sites, beaches and water born scenic activities to be found in the Aegean. 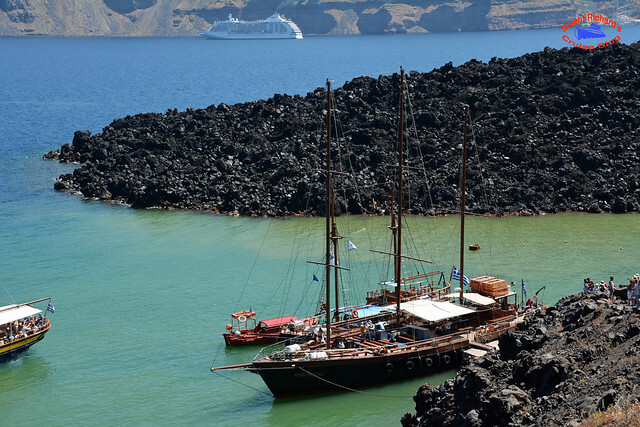 What else is there to do on Santorini? 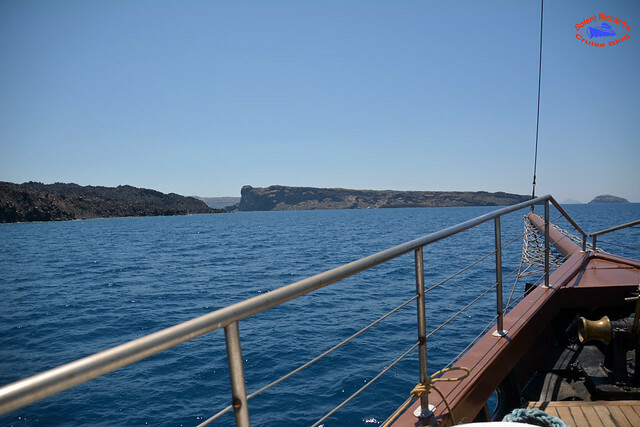 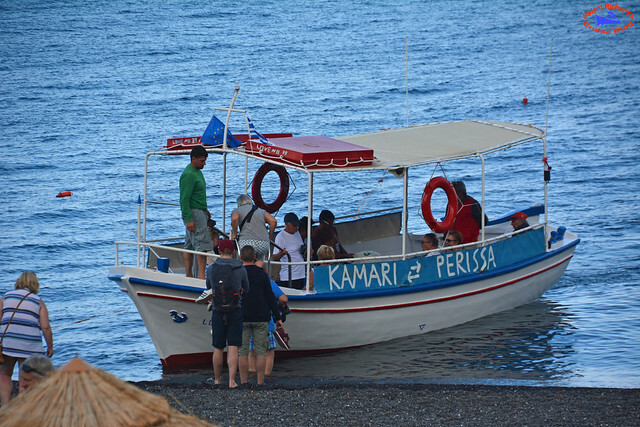 How’s about a boat cruise around the Caldera? 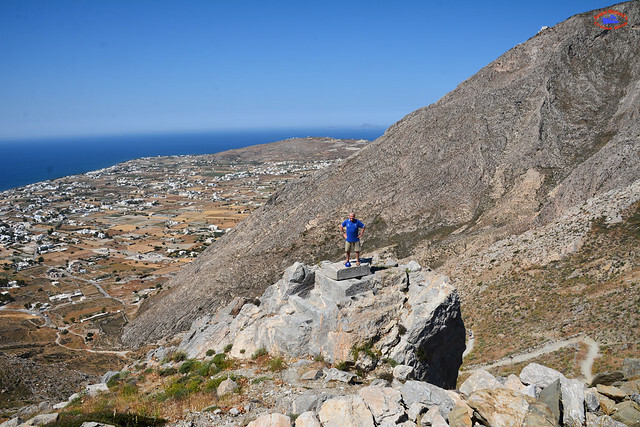 I had set my heart on reaching the summit of Thirasia in order to capture the views which began to unfold as I climbed the path in the direction of Manolas. 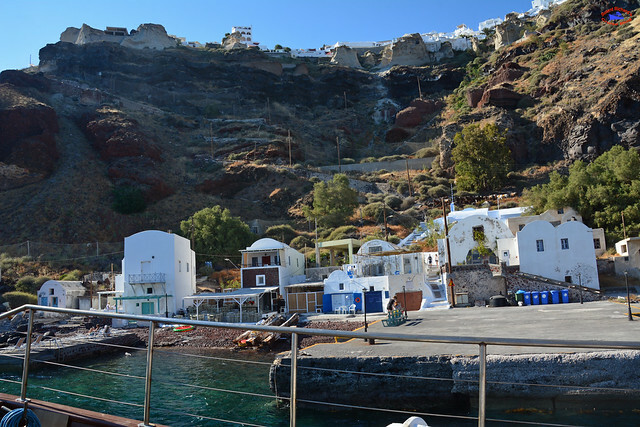 Our boat trip also included a stop at Oia and that has already been covered earlier. 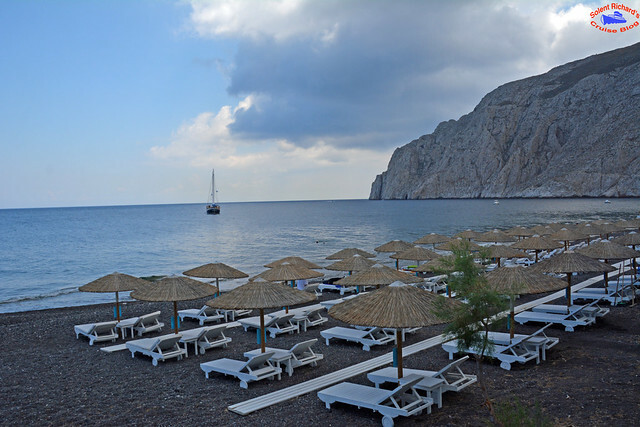 What about a day on the beach? 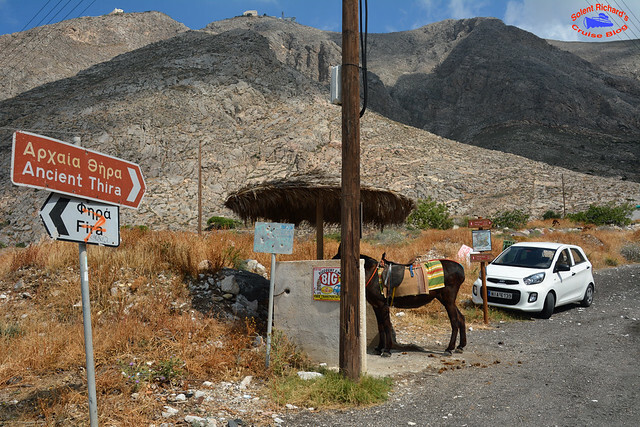 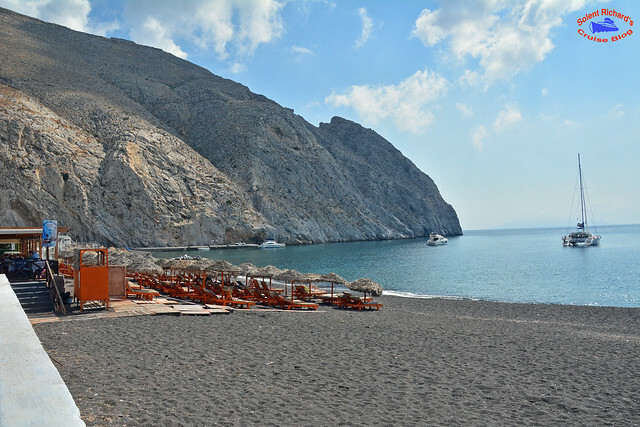 The two beaches are, in fact, divided into two separate resorts by Mesa Vouno mountain: a fact I will revisit when I cover the visit to Ancient Thira. 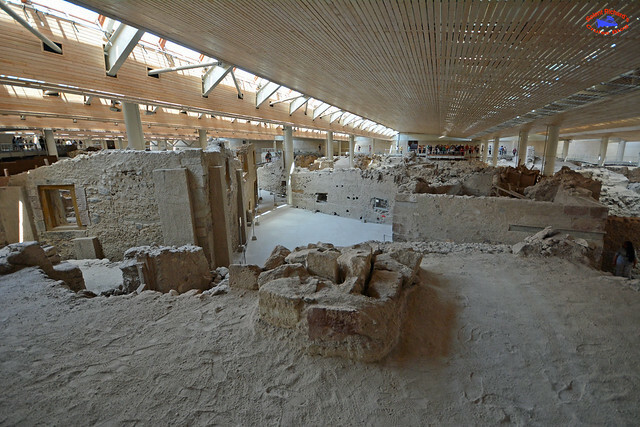 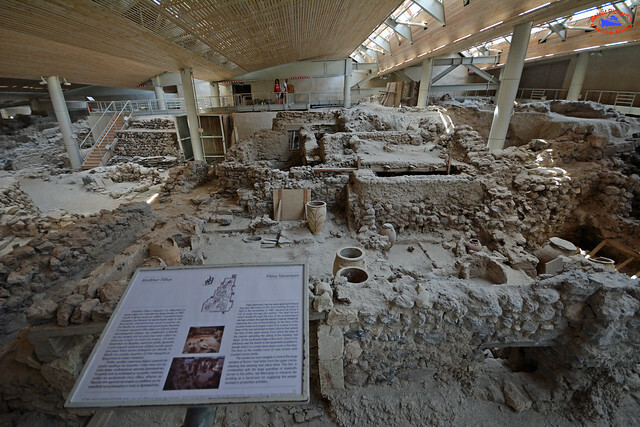 The Prehistoric Town of Akrotiri was the centre of a highly advanced civilisation around 1500 BC. 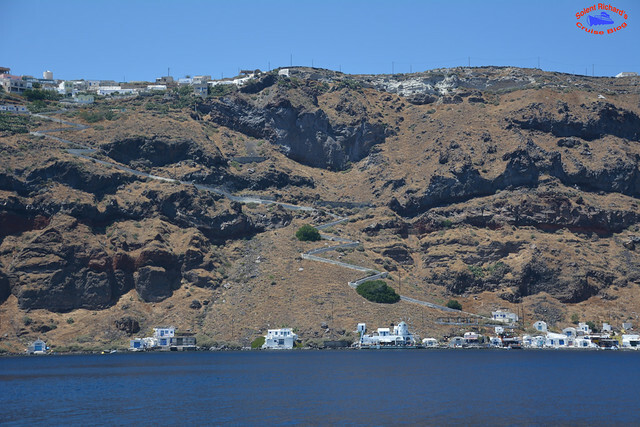 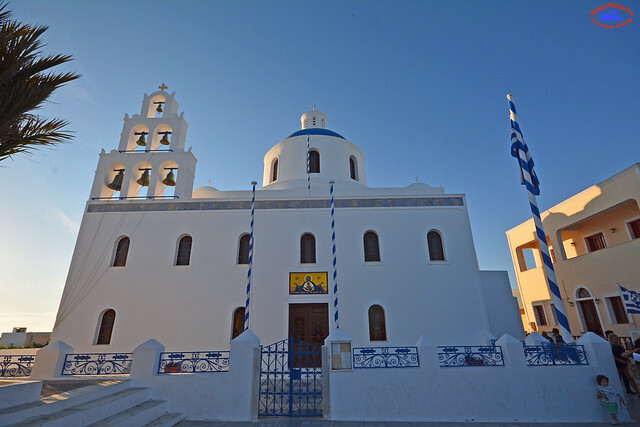 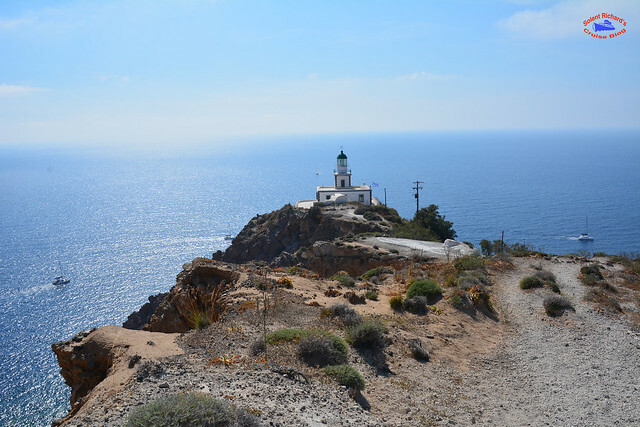 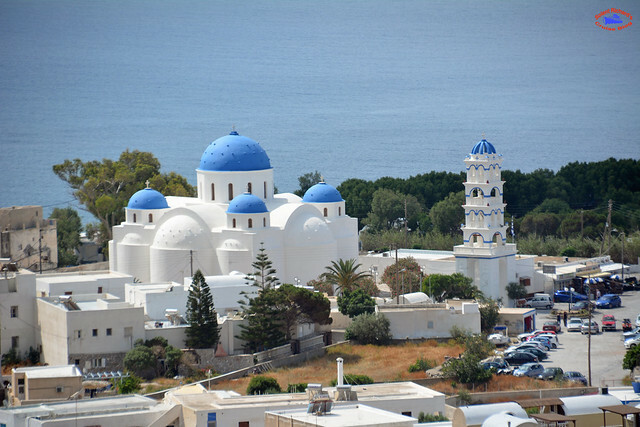 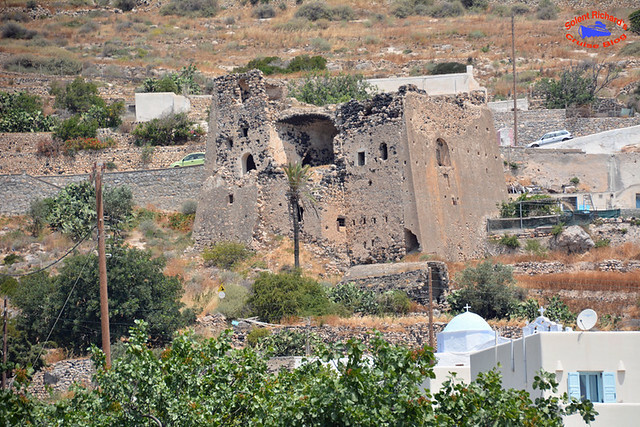 It is without doubt the best preserved such site in the Aegean and is easily reached by local bus from Fira. 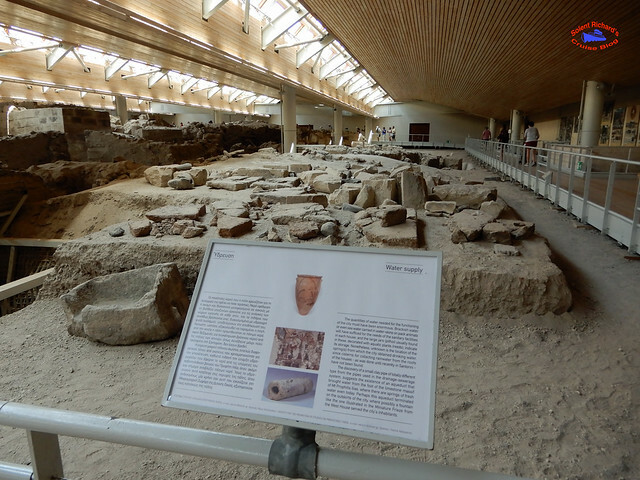 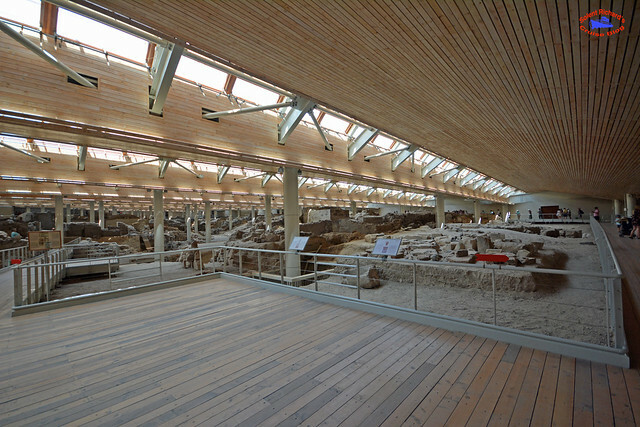 All in all the Akrotiri Prehistoric Town is well worth a visit, particularly for those with an interest in such sites. 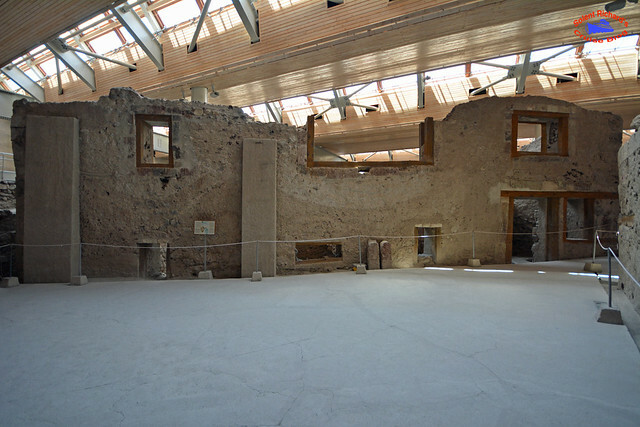 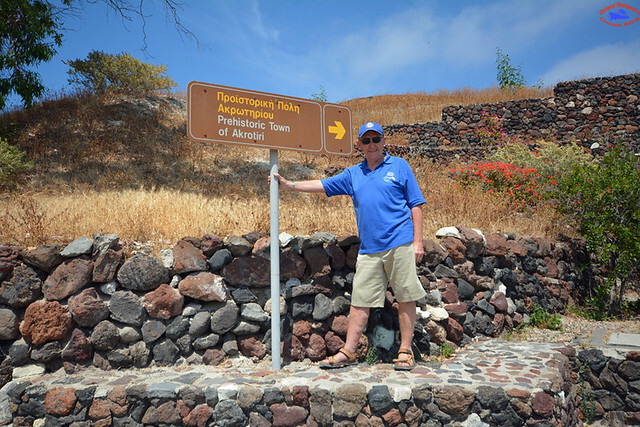 Ancient Akrotiri is a Minoan outpost at the southwestern tip of Santorini. 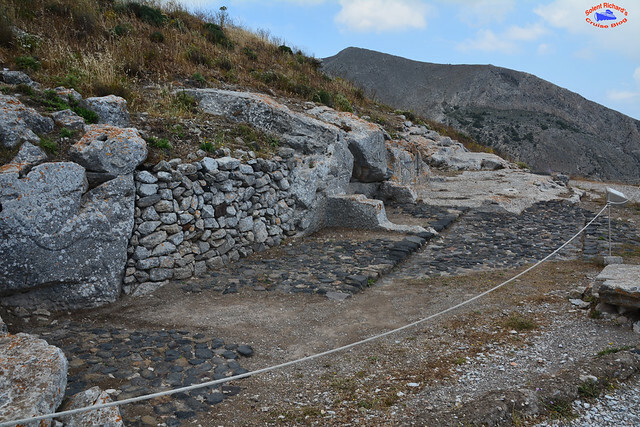 It is the most important archaeological discovery in the Eastern Mediterranean, being the largest Minoan city outside of Crete. 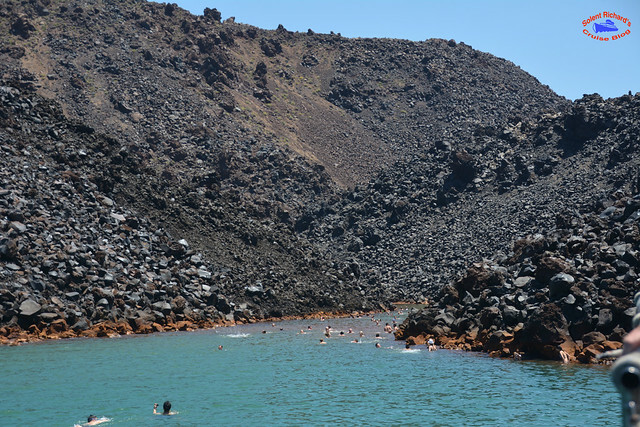 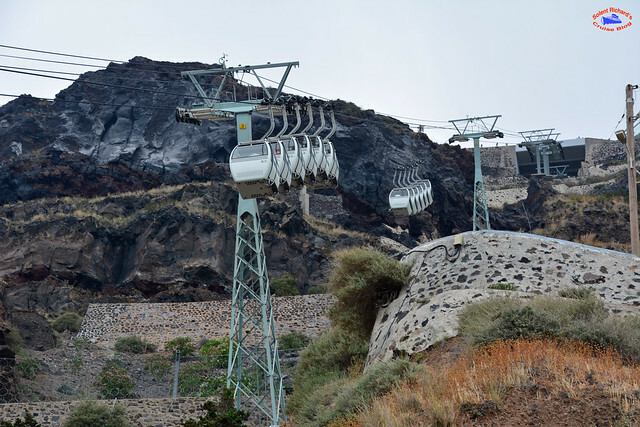 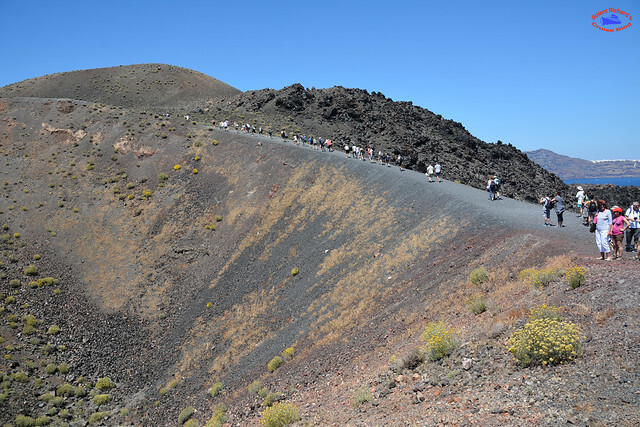 The site was first discovered in 1866 after a volcanic eruption. 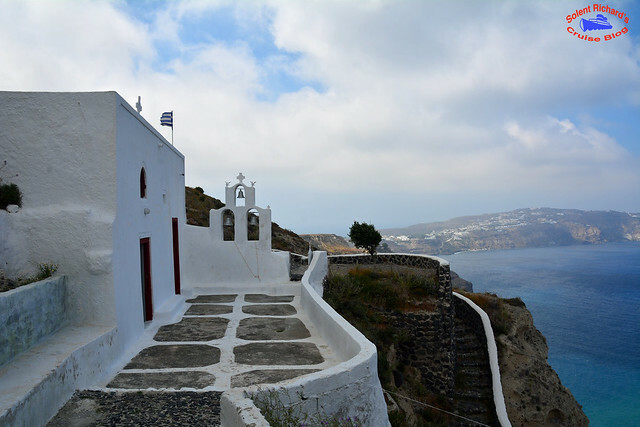 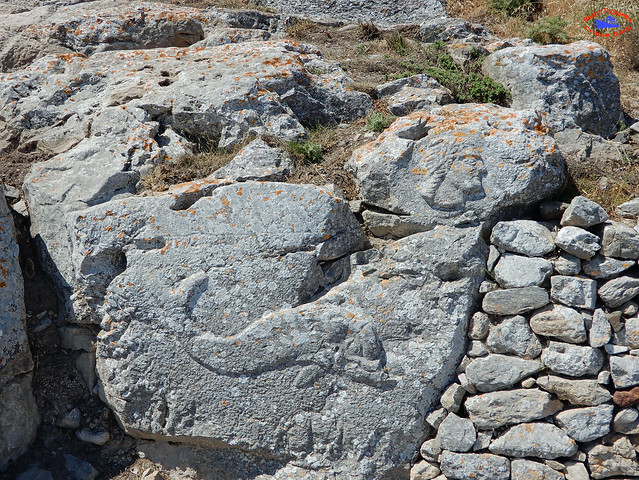 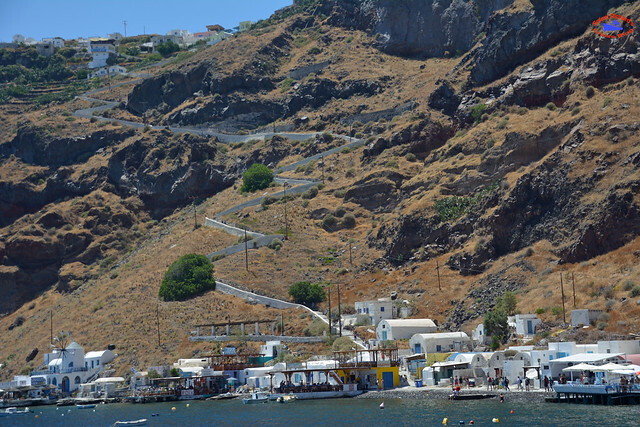 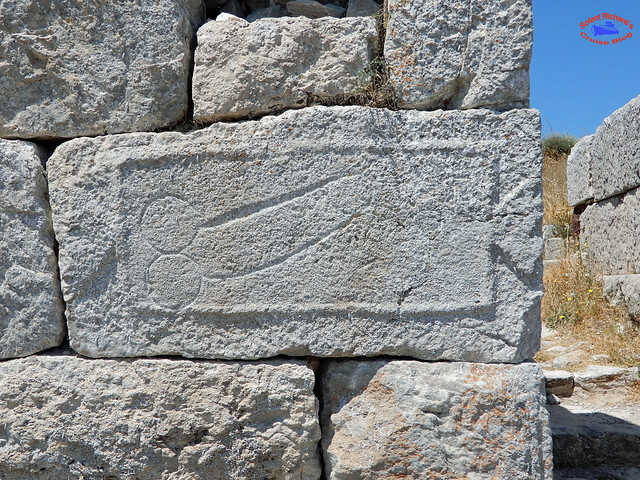 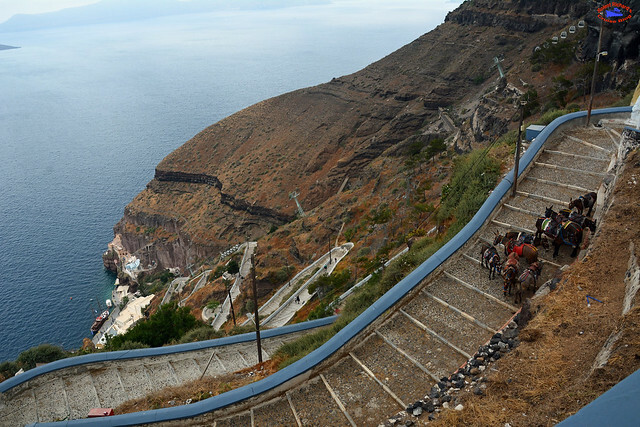 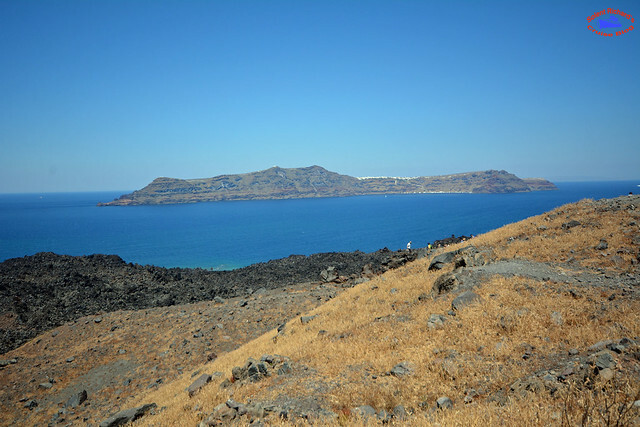 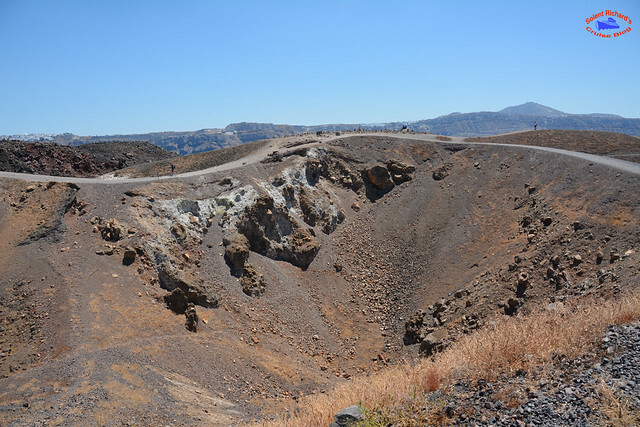 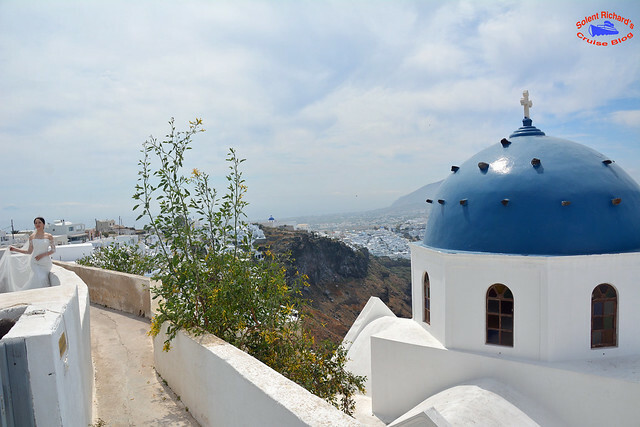 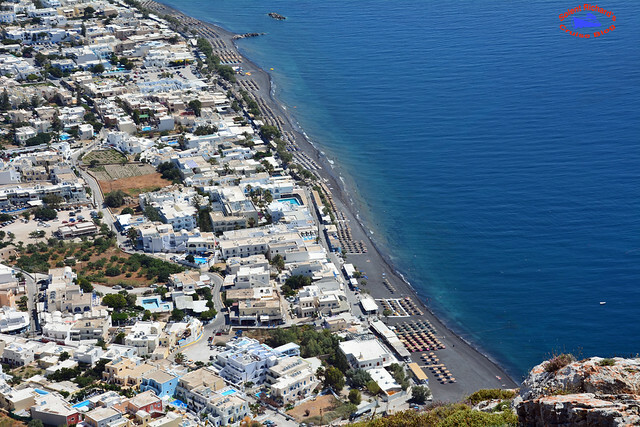 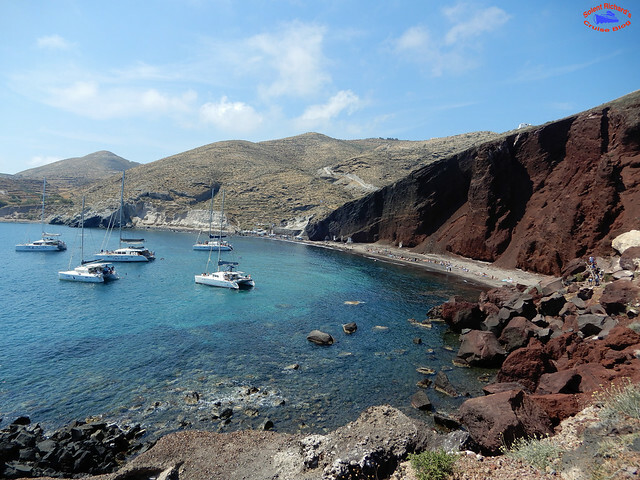 The second of the Santorini archeological sites worth visiting is that of Ancient Thira. 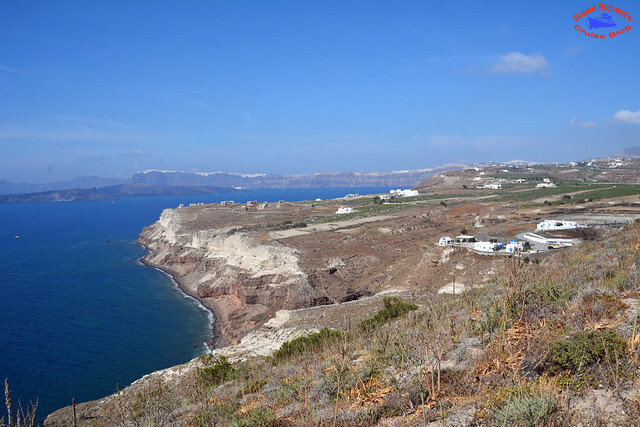 The ruins of Ancient Thira are located on a headland called Mesa Vouna between the two popular beaches of Kamari and Perissa. 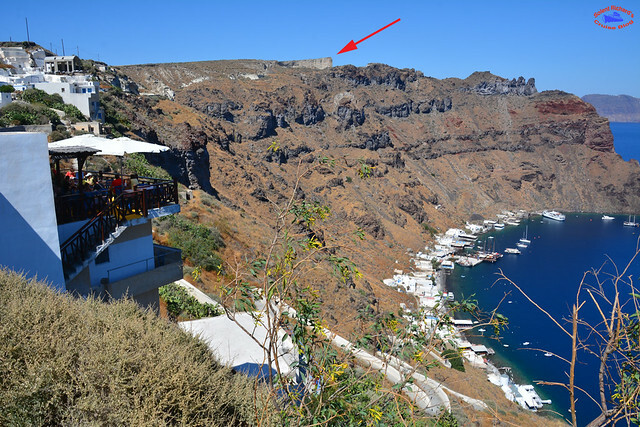 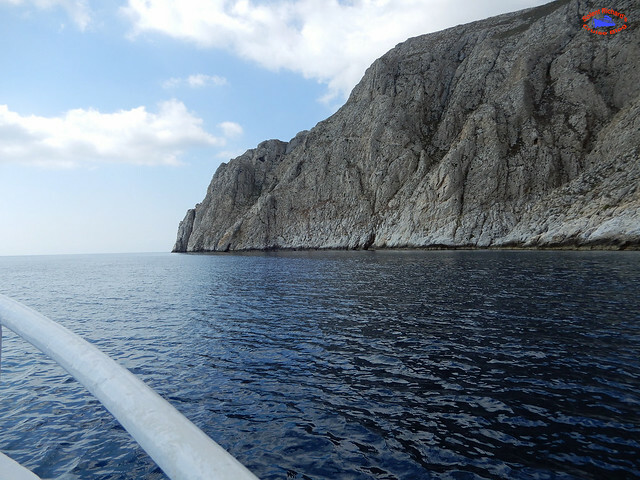 In addition to its ancient ruins, the site offers spectacular views over cliffs that drop into the sea on three sides. 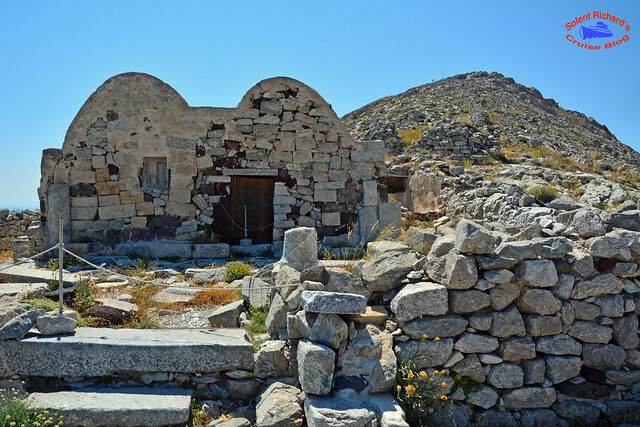 Built on a huge rock circa 1650, the name Katefiani comes from the word ‘katefio’ meaning refuge or hideaway and it was used in the past as a refuge for the locals in times of war and pirate attack. 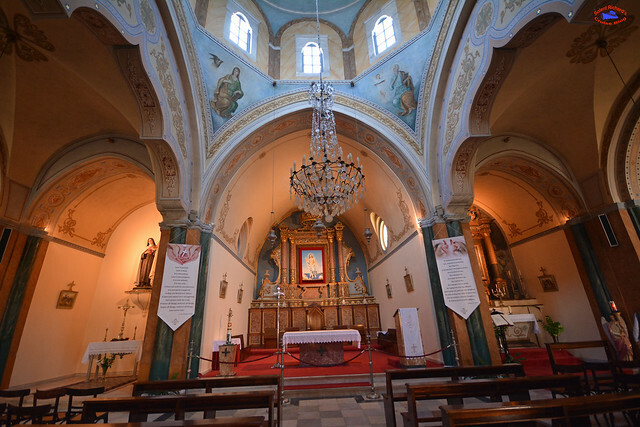 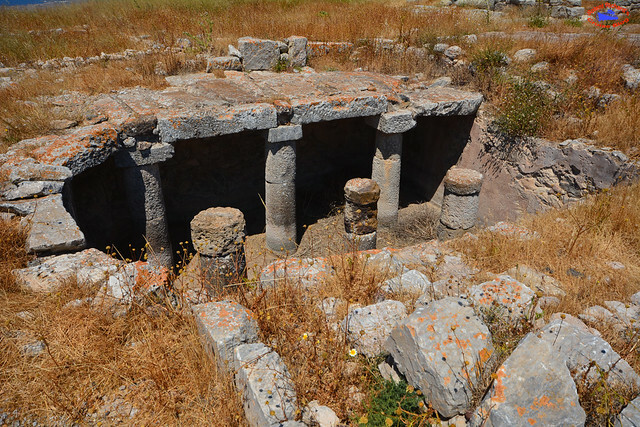 Behind the chancel, there is a small cave with an ancient fountain whose water is believed to have therapeutic effects. 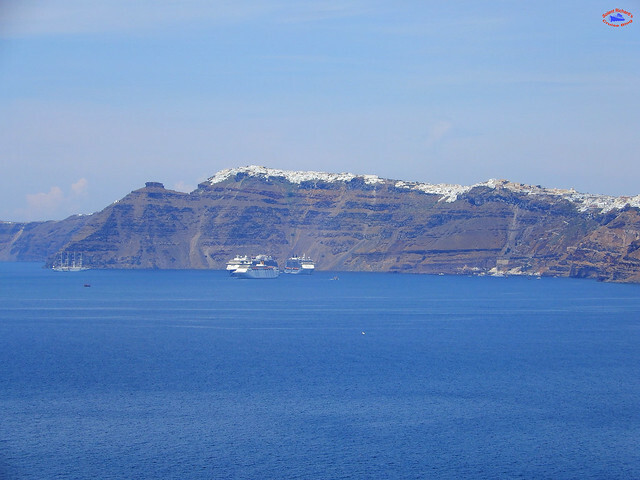 The mountain of Profitis Ilias, Santorini’s highest peak, runs eastward into the lower rocky outcropping of Mesa Vouno. 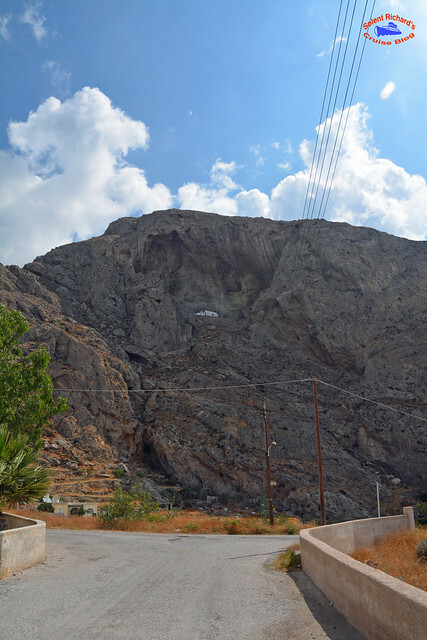 These two mountains are joined by a ridge named Sellada. 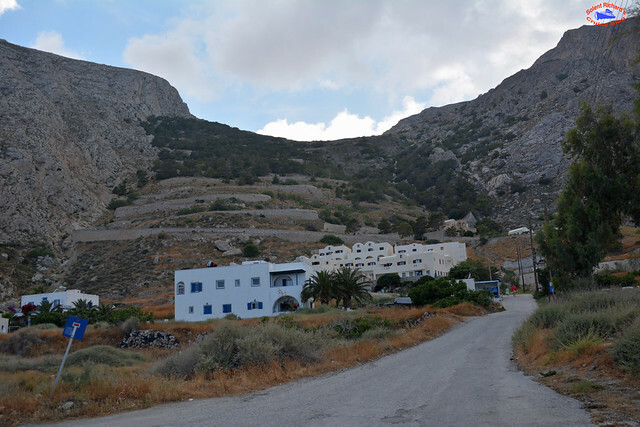 At an altitude of 369 metres, Mesa Vouno extends from west to south and its steep slopes plunge to the coast at Kamari to the north side and Perissa to the south. 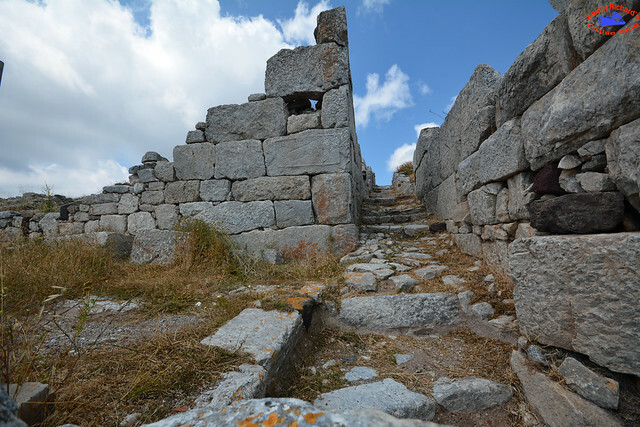 A naturally fortified spot, it was an ideal place for the Spartan colonists to found their city. 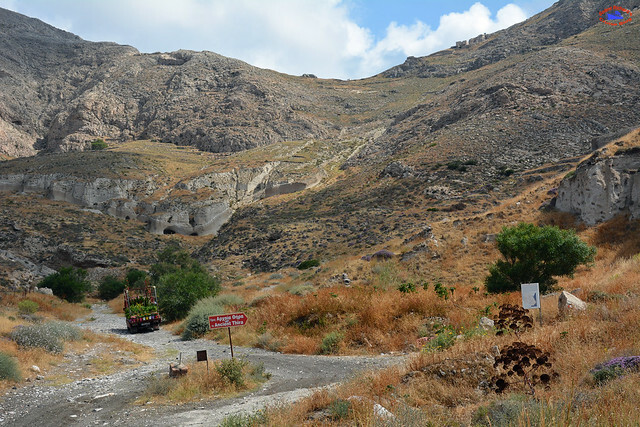 They built two roads, one to Kamari, where they had their port, and the other to Perissa. 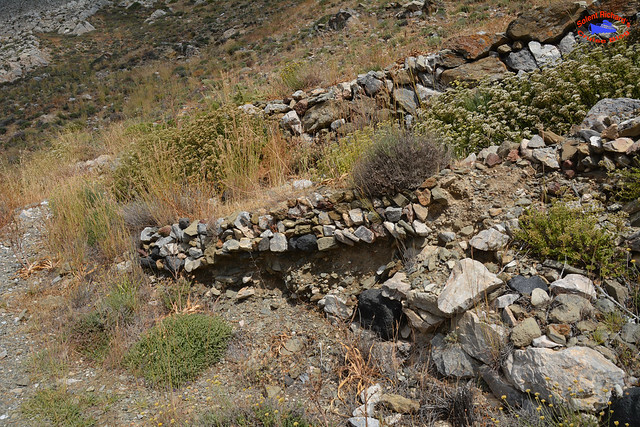 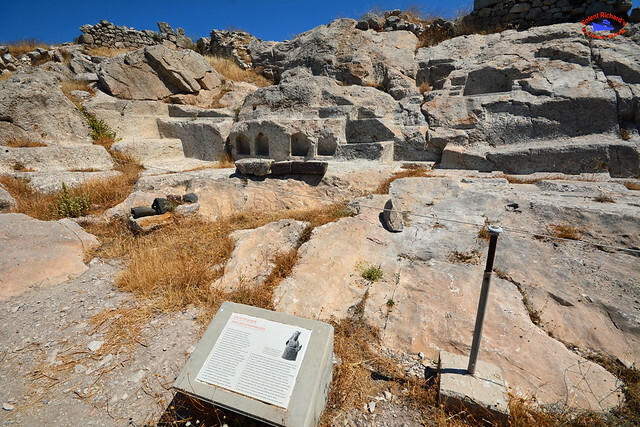 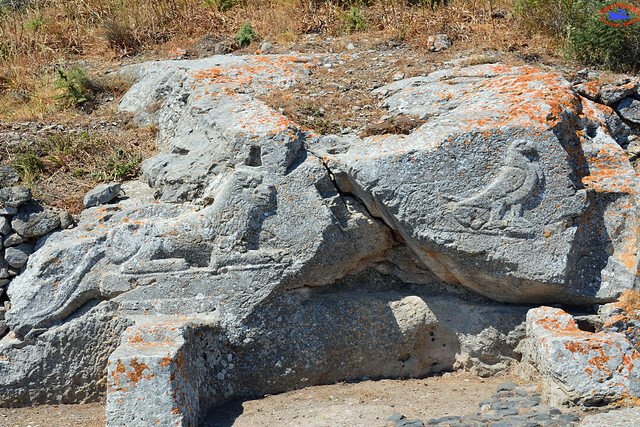 Excavations began in 1896 and revealed ruins of a town which bore evidence of settlement as early as 9th century BC. 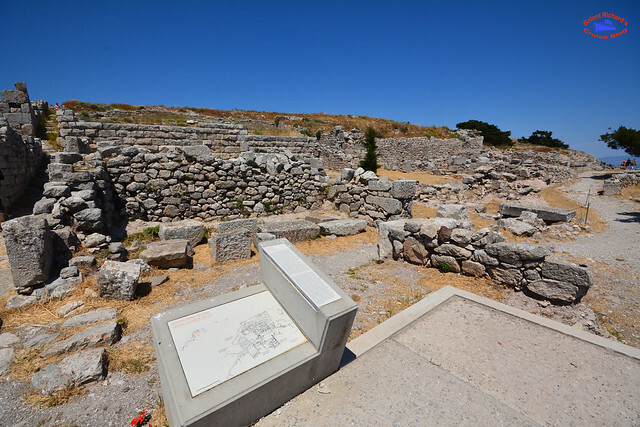 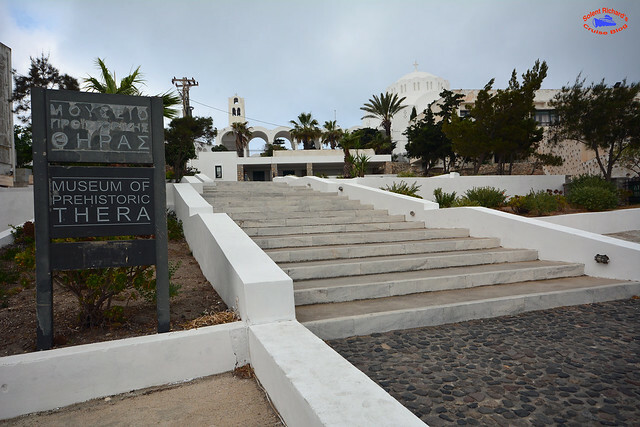 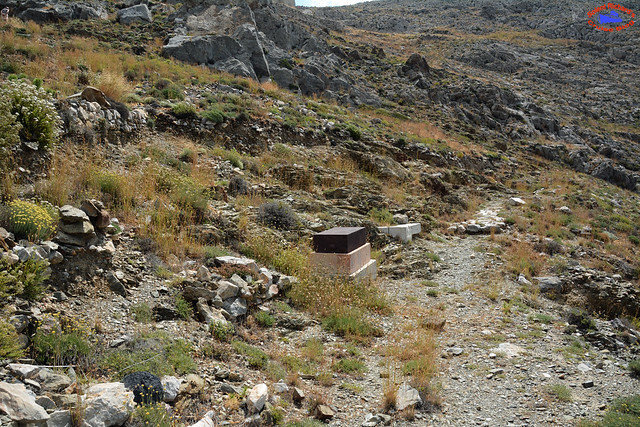 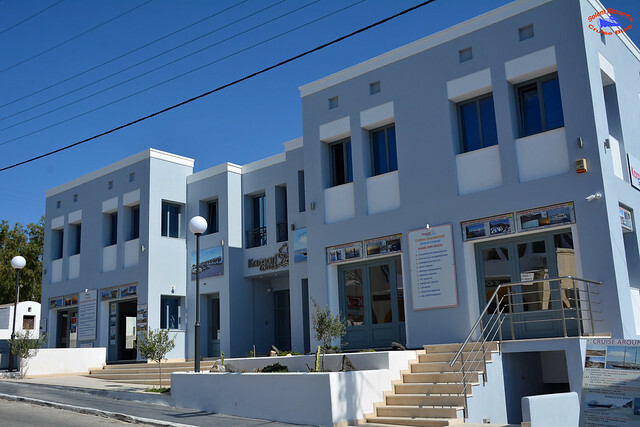 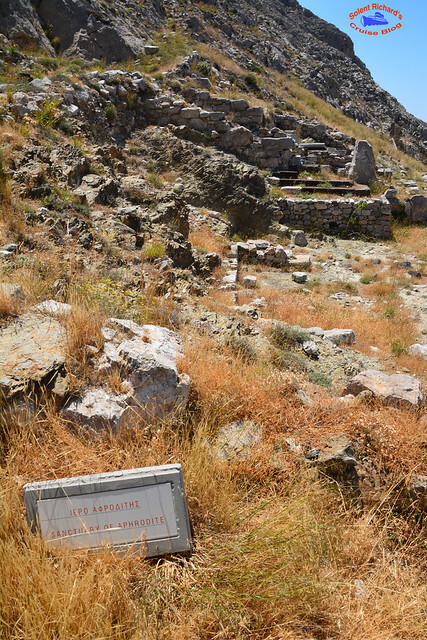 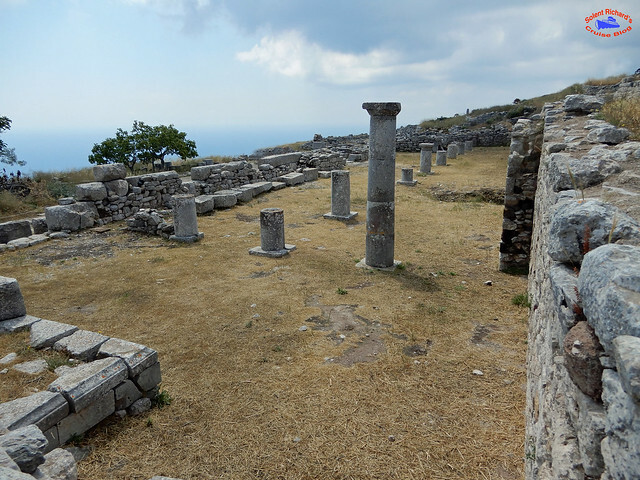 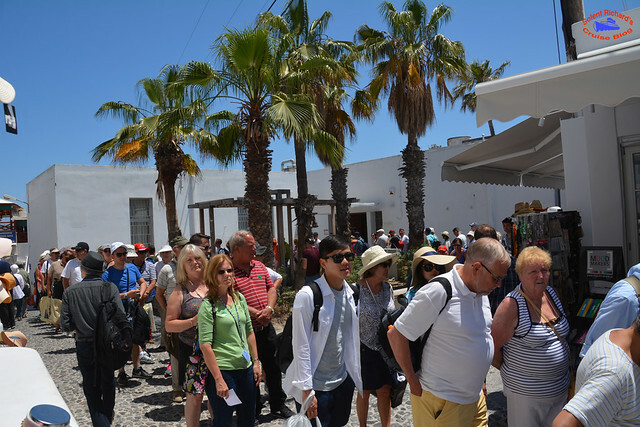 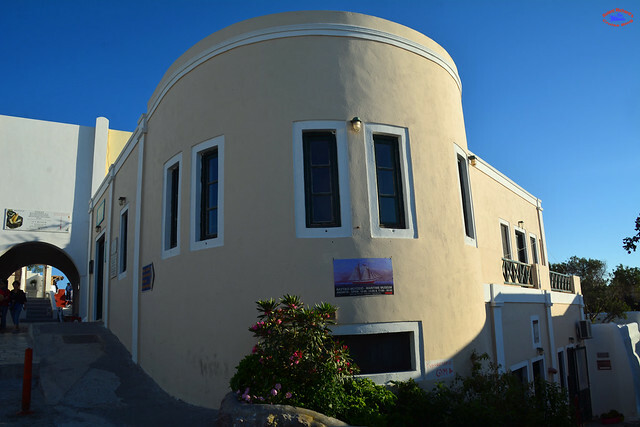 The archaeological site of Ancient Thira is open daily except Mondays from 08:30 am until 14:30 pm. 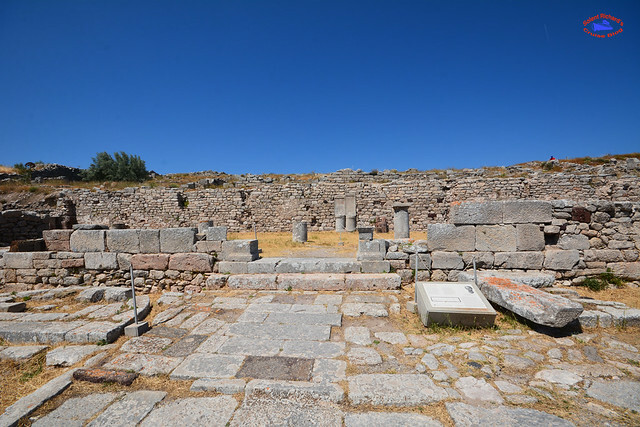 The temenos was founded in the mid 3rd c. B.C. 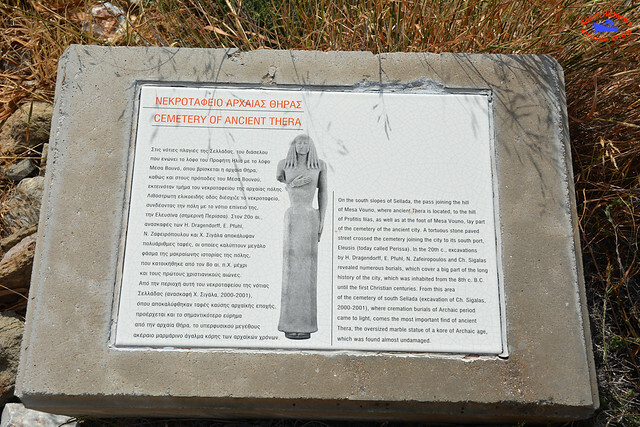 by a priest named Artemidoros. 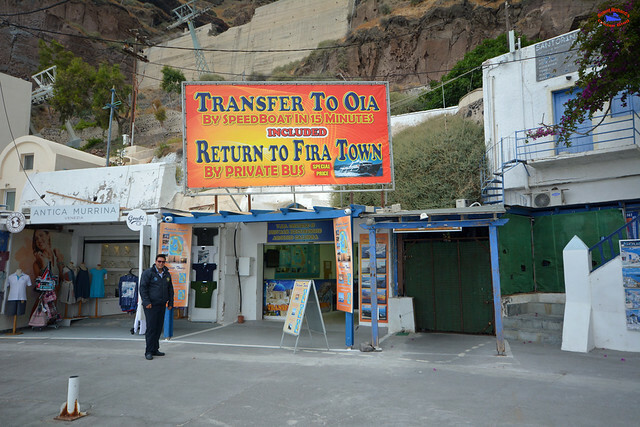 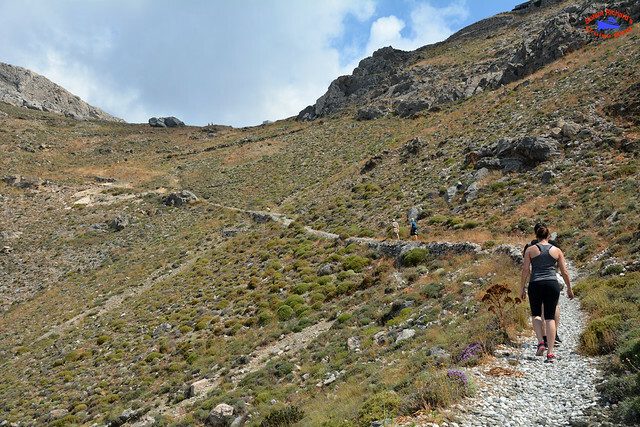 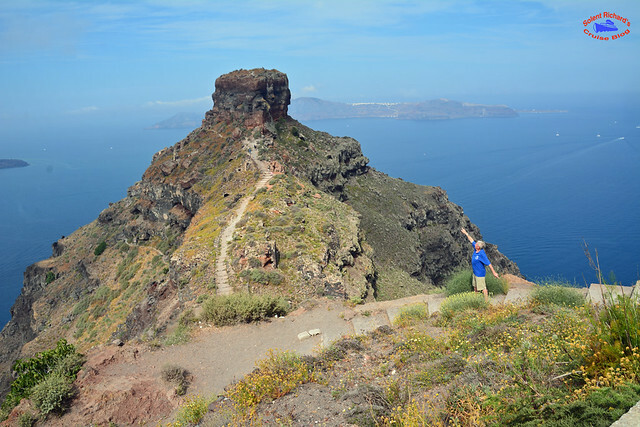 Ancient Thira is a fascinating site to explore and certainly around two hours should be allocated for a visit. 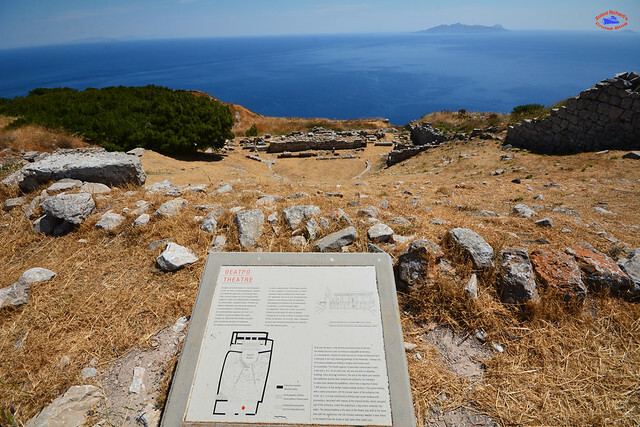 It is amazing to be able to walk around a site, not only of such archaeological importance but one with such incredible views. 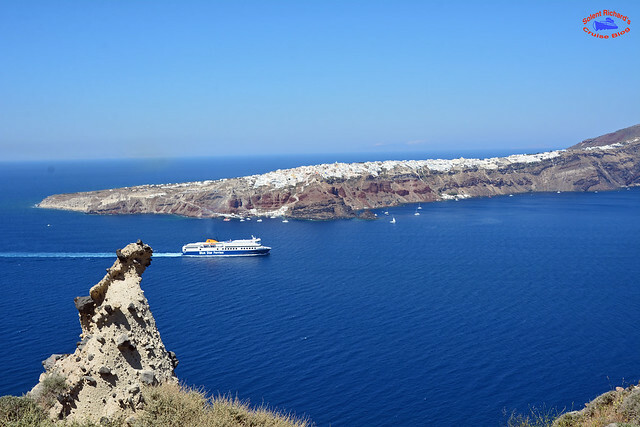 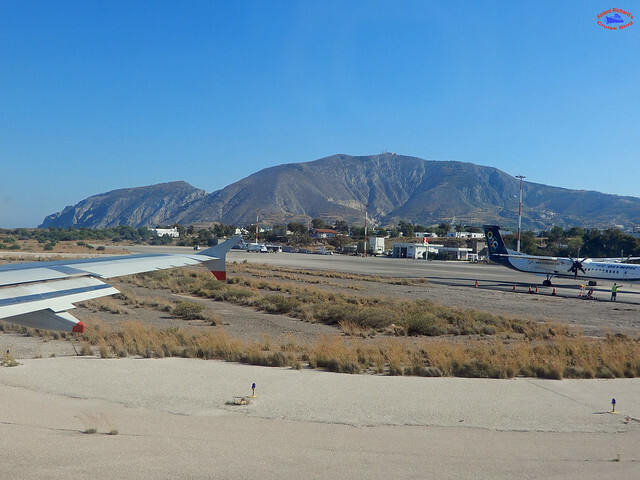 I hope that this review has illustrated that a port visit to Santorini isn’t just a chance to wander a few streets of the islands capital, Fira. 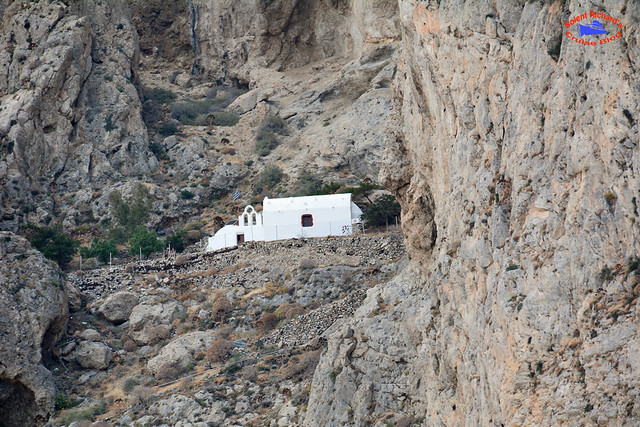 …balanced precariously on the Thermi cliff tops above cliff hewn houses. 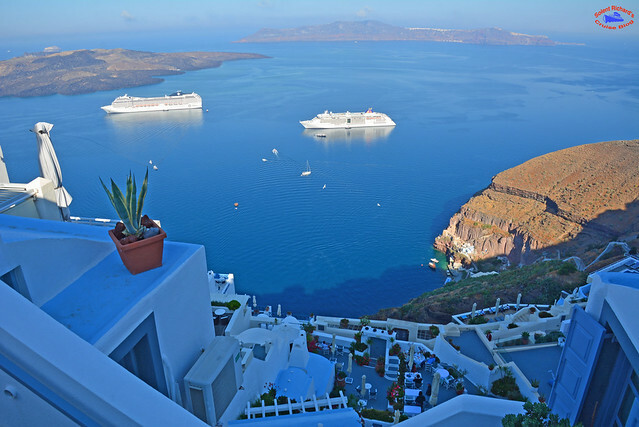 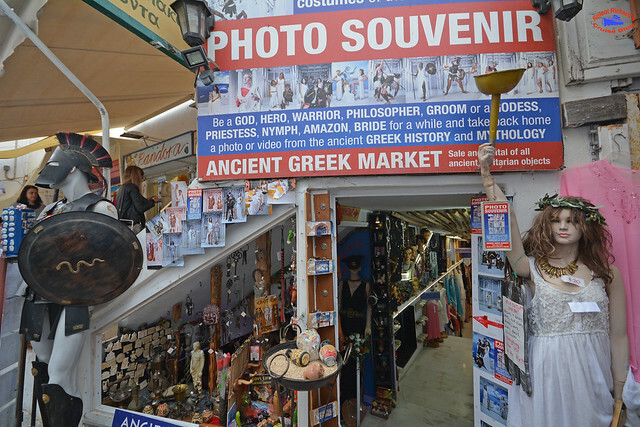 But, whatever one chooses, enjoy your visit to Santorini, there is lots on offer. 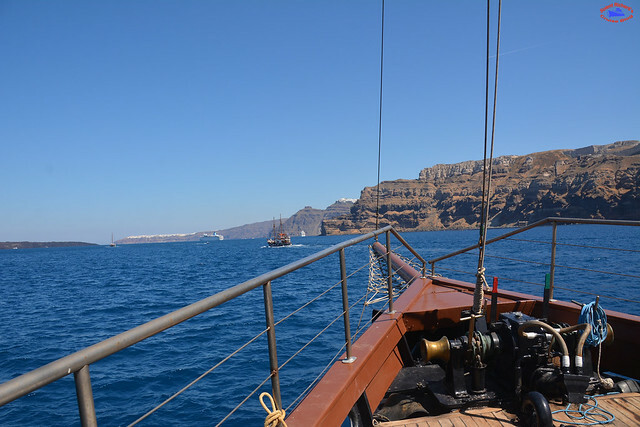 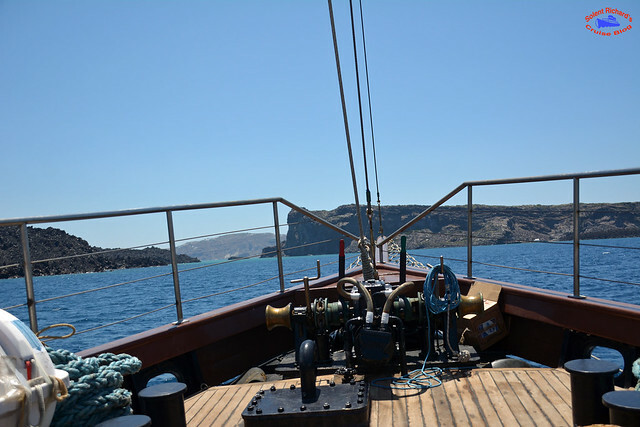 If you have enjoyed this review of Santorini and would like to be amongst the first to hear of new reviews including a forthcoming cruise review of Star Clipper and a Mississippi river cruise onboard the American Queen, plus port reviews of Bordeaux and Hong Kong, why not join over 580 followers by clicking on the ‘Follow’ link on the front page. 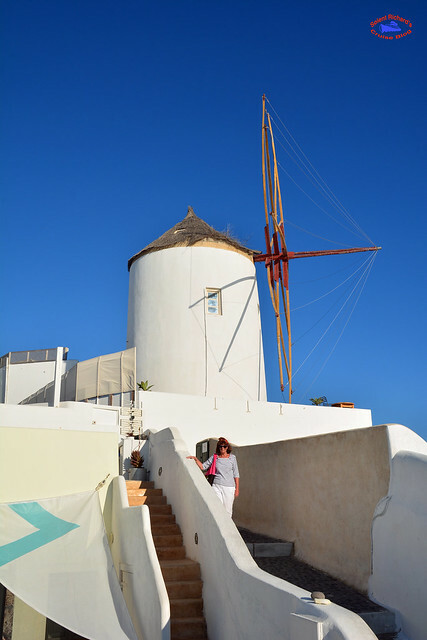 You will be alerted by email immediately a new post appears. 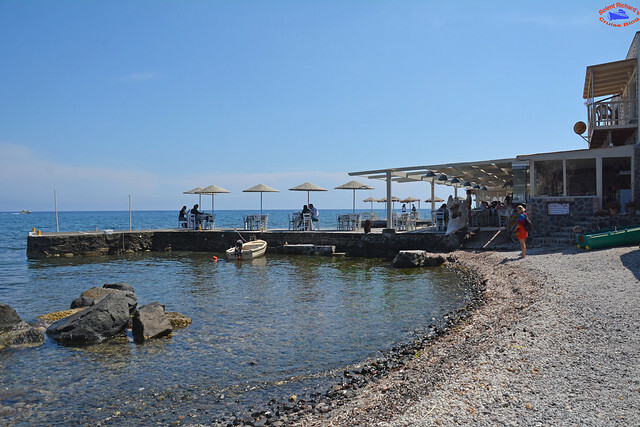 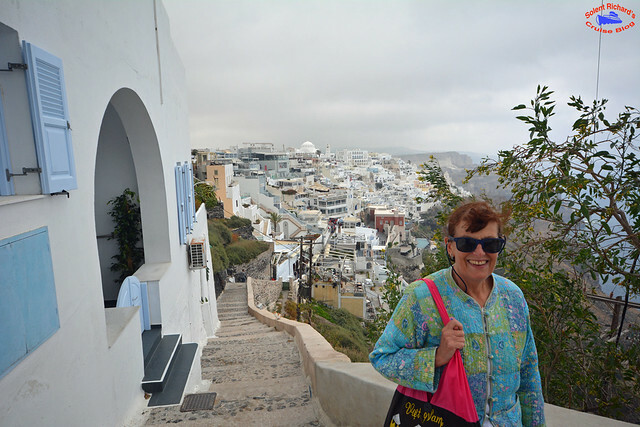 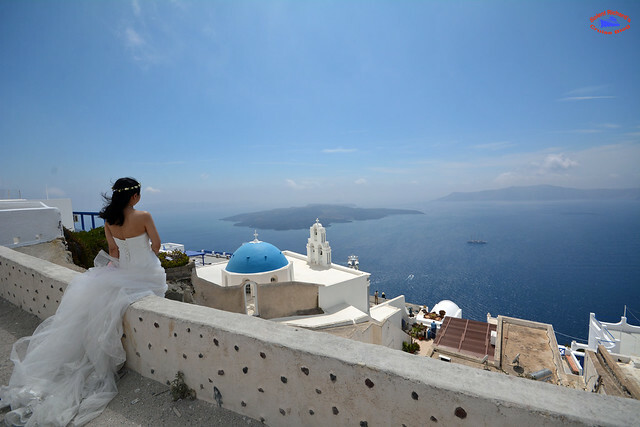 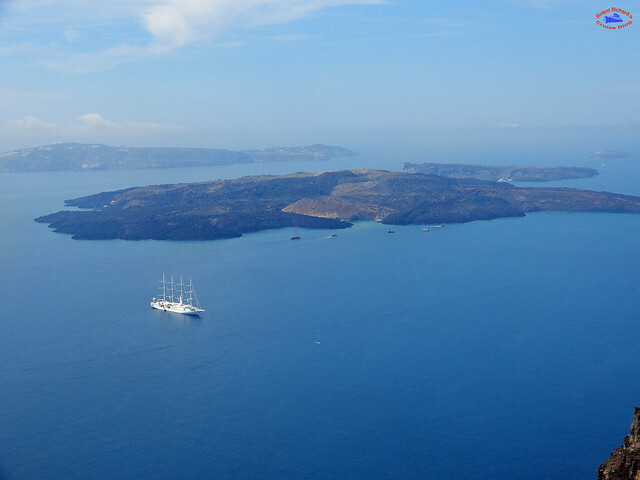 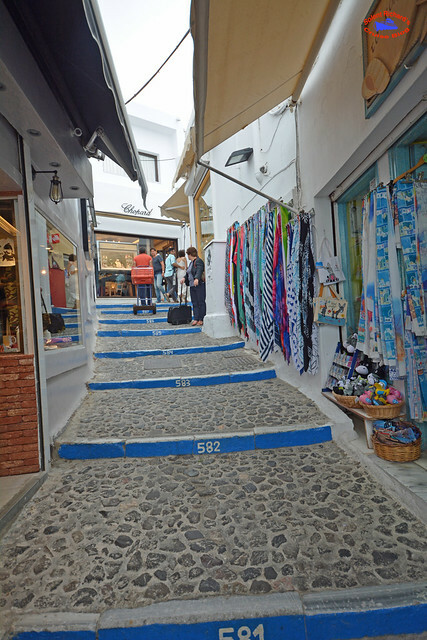 Hello RichardI really enjoyed reading your blog for Santorini and indeed all of your blog entries! 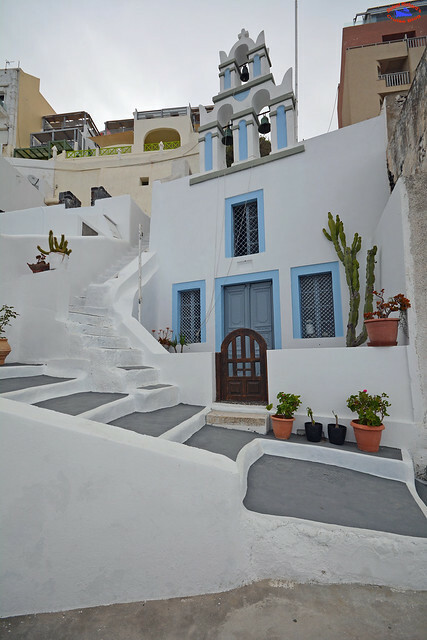 May I ask if you stayed in Santorini and, if so, which area did you stay in? 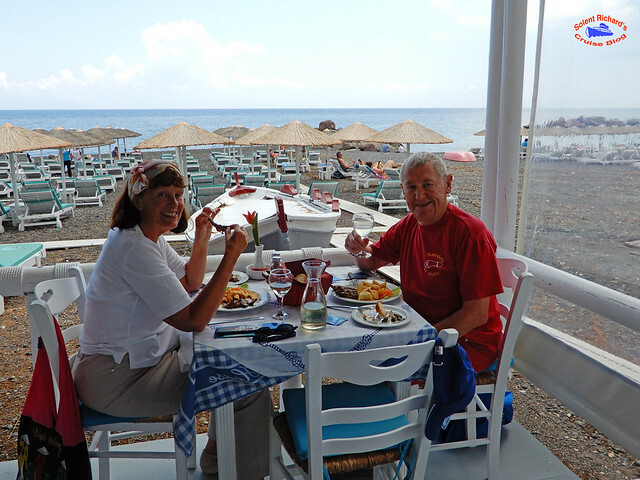 I do hope that you win the blogging award, I have voted for you anyway! 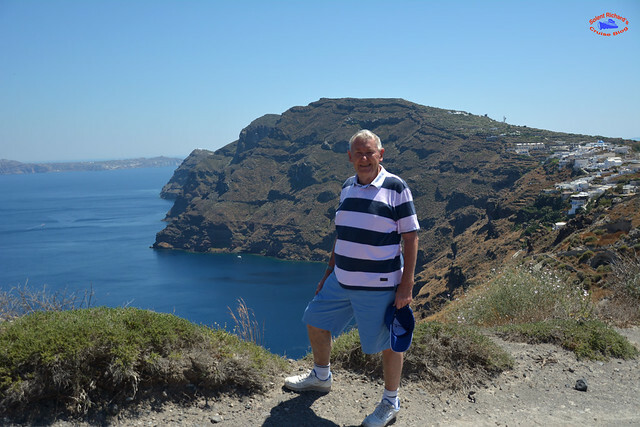 Richard, A real pleasure to vote for you, good luck and keep up the blogging, always a pleasure to read. 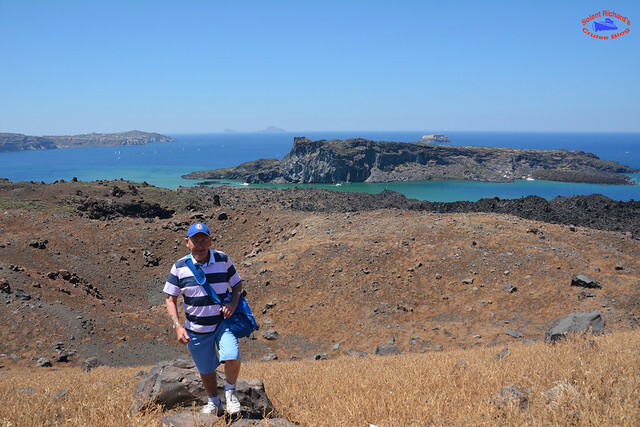 Excellent blog! . 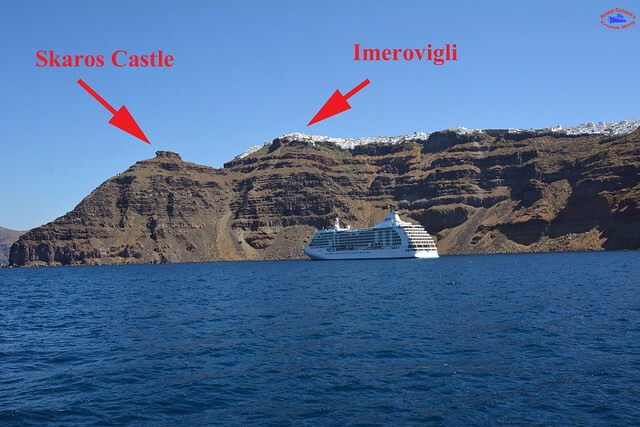 We’ve been to Santorini twice now on cruises, yet I still learned something from this excellent blog. 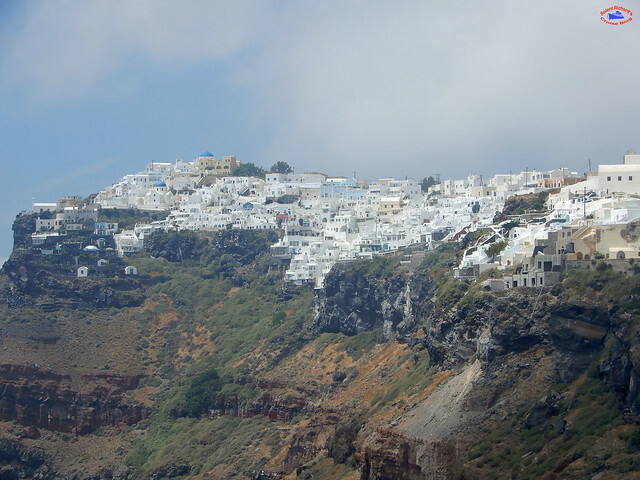 You’ve also inspired me to put Ancient Thira high on my list of “must sees” if I get back there. 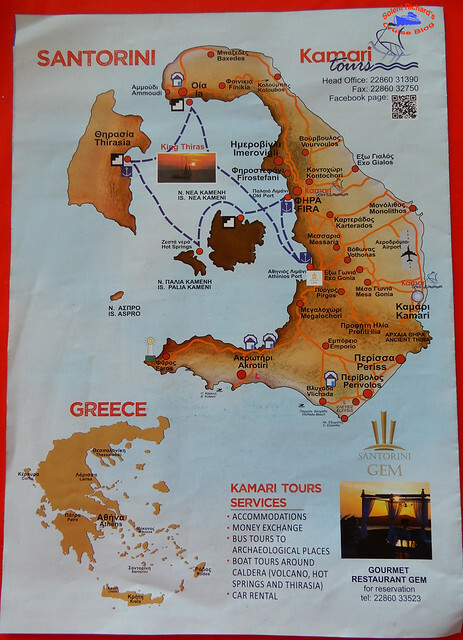 We rented a three-wheeler both times we were there and had amazing days exploring the island. 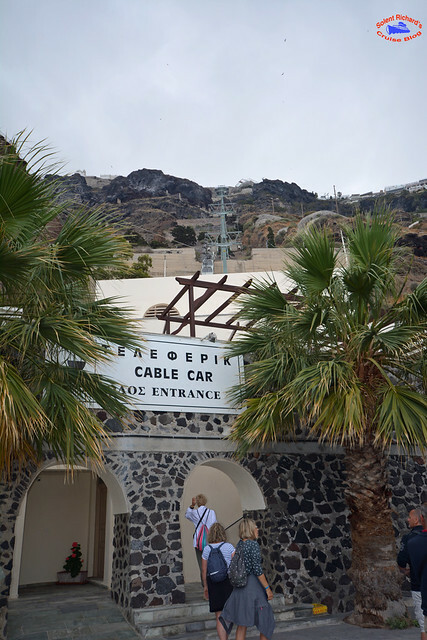 It’s our favorite place of all the places we’ve visited. 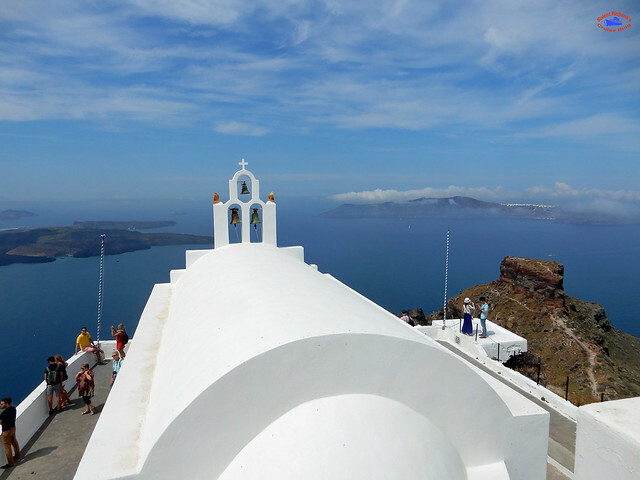 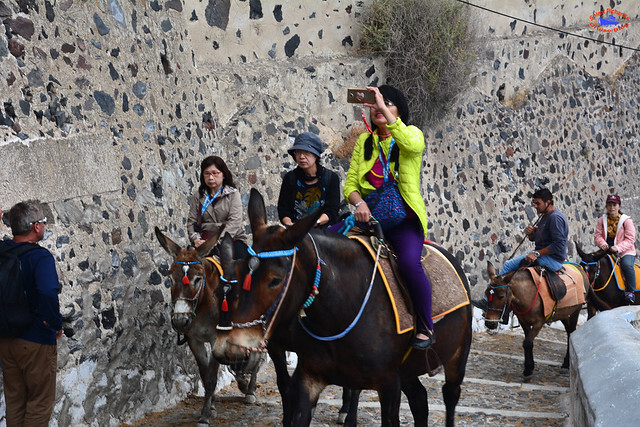 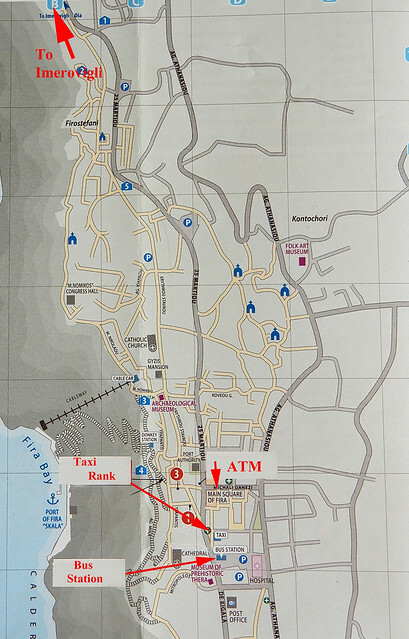 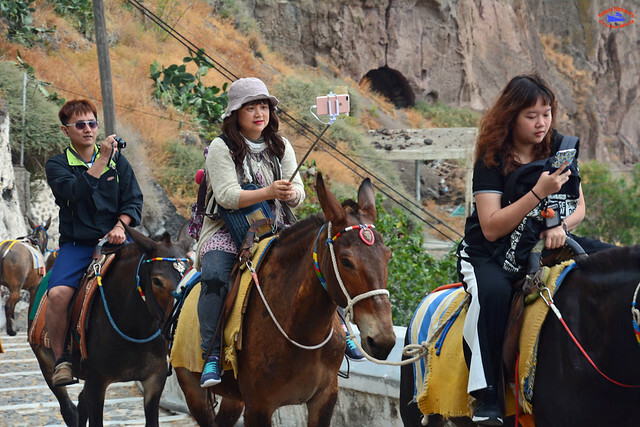 Thanks for the additional ideas for things to do during a visit to Santorini. 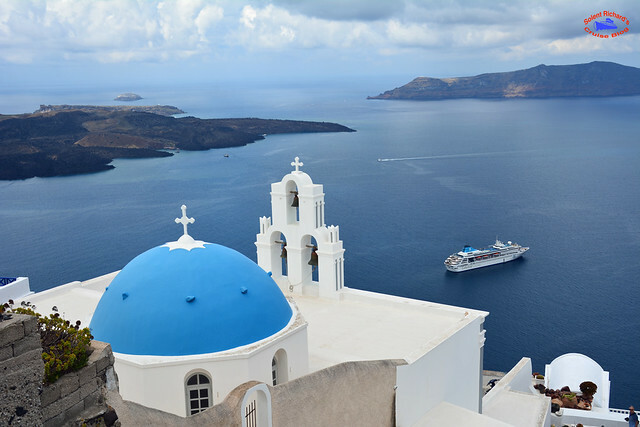 RV Rajmahal River Ganges Cruise. 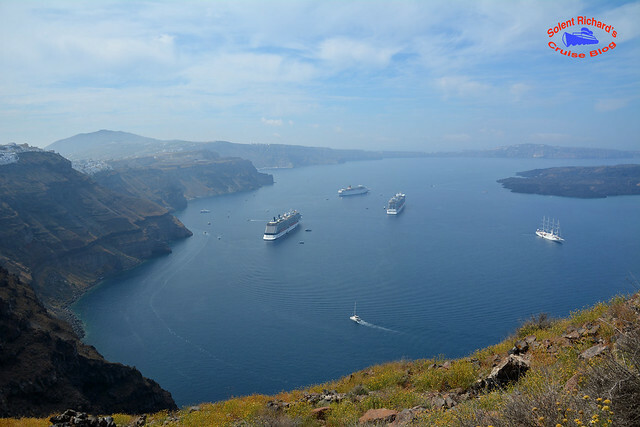 Carnival Dream – A very pleasant surprise. 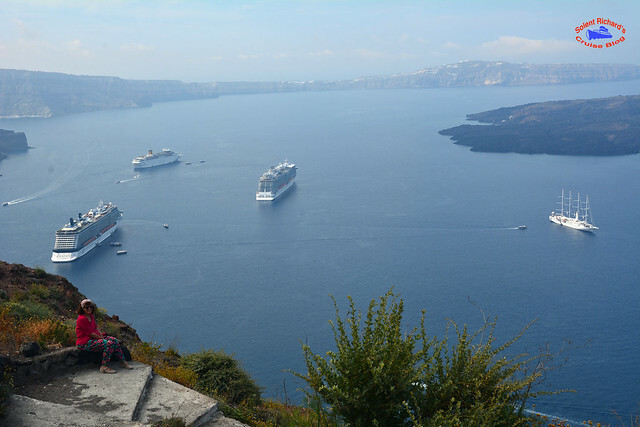 A self confessed Cruiseaholic...... with barely enough funds to support his passion!